When an article is described as ‘evergreen’, this means that its content is based on tips, resources, or other topics that do not go out of date as quickly as those of current events. 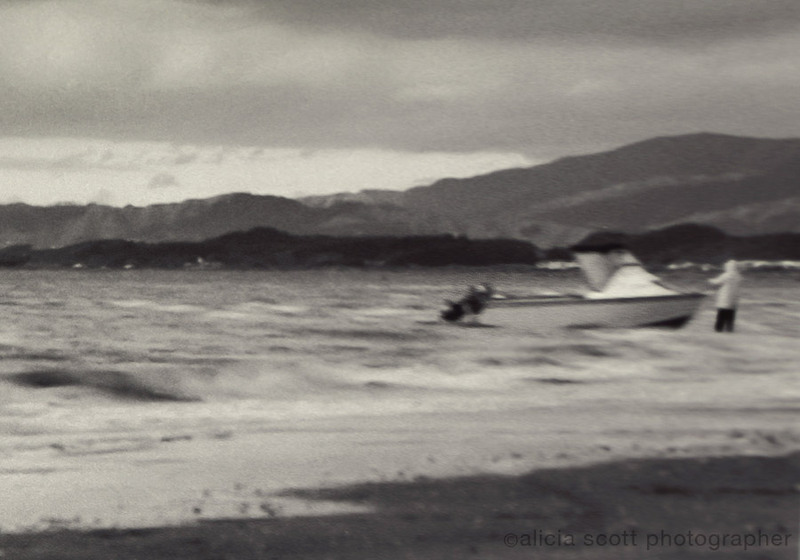 This is the objective of the first post on my Breathing Travel | Documenting the journey blog, where posts are dedicated to my coursework at MatadorU. Inspired by my sister’s upcoming trip as a first-timer to Europe, I decided to collate a series of tips for her. Take a look and I’d love to know whether you’d add any more tips. My sister is embarking on her first European trip in a couple of weeks and I couldn’t be more excited for her. Living ‘Down Under’, in 200+ year old Australia, the rest of the world can, at times, seem so out of reach; a trip to Europe is definitely high on most Aussie to-do lists. My sister’s own feelings of excitement will undoubtedly give way to wonder, amazement, and awe when she steps foot into London – her first stop after a 20+ hour plane trip. Jet lag? Shelve that for the trip back home to Sydney! 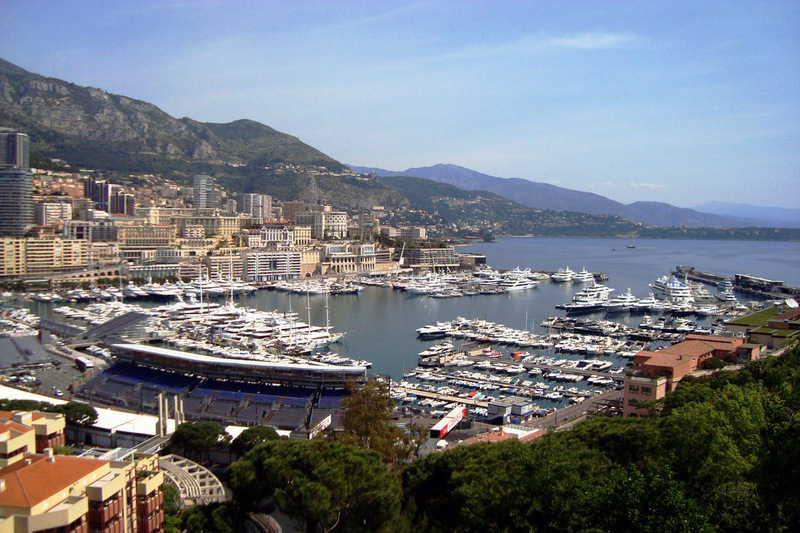 That said, I cannot help but take on the role of protective sister; about 2 weeks out of my little sister’s 4 week vacation will be traveled solo as she makes her way through Mediterranean exotica. As liberating as this part of the trip will be, I wanted to share some big sister advice on pre-planning; to try and avoid any unnecessary solo-traveler anxiety. (Mum, I am doing this for you too). Sister, and interested others – this list is yours to print out and keep by your side. Don’t buy a black suitcase. Buy a well-made reputable brand – preferably one that is on sale because of a low-selling design pattern, or not-so-popular colour. Why? No-one will really want to steal it, and it will be easily recognizable on the carousel. Pack clothes to look like a local. Classic basics are ideal to mix n match on a daily basis; go easy on the shoe selection. 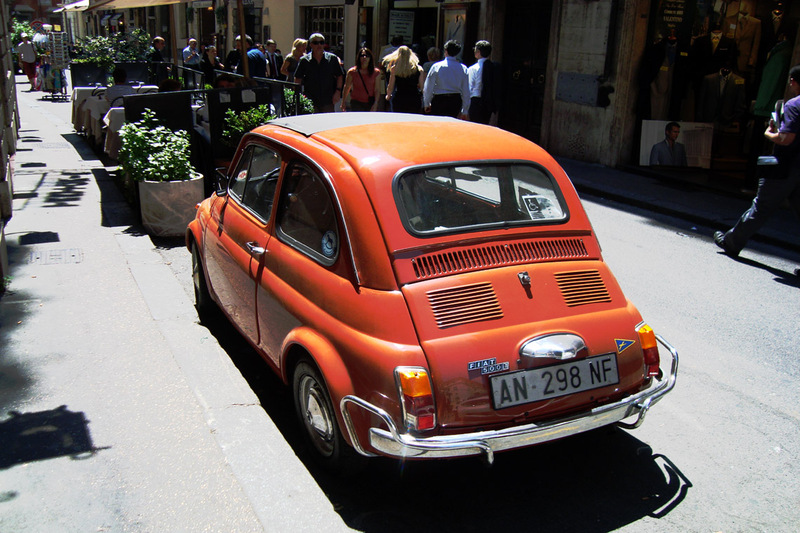 Please – no ‘I Heart Roma’ T-shirts paired with stark-white sneakers… you know why. Leave the jewels at home. Keep the toiletries to a minimum. Save room in the suitcase and head to Boots pharmacy in the UK to stock up. Buy a small sunscreen to keep in the purse – the exposed top decks of the hop on/hop off bus tours double up as rooftops for sunbaking. Be sensitive with electronics. Keep chargers and the e-book safe in your hand luggage AND buy a plug converter. Care for the Camera. Keep the compact in its case; perhaps buy a second battery and memory card that are ready-to-go in case the others run dry half way through the day. Plenty of pictures will be taken – I know it! Load up the e-book and ipod with your favourite shows, files, and songs, to make the most out of those plane or train delays. Wandering around with earphones is a no-go, especially in cities like London where crowds and traffic reign. It’s easy to get distracted. Pack miscellanea. Gather together some wet-wipes, tissues, lollies/sweets, band-aids, notebook with pen, and Panadol/Advil – stash them in your purse. They will come in handy at some point, promise. Curb homesickness. Take a few of your favourite family-and-friend photos as well as something to remind you of home. Absence makes the heart grow fonder. Photocopy documents 3 times: passport, itinerary (see * below), airline tickets, insurance papers, and credit cards. Leave one at home with always-contactable parents/friends; put another copy in your hand luggage, and the other, in the suitcase – just in case the purse gets lost. *Create a detailed itinerary with hotel, tour, train, information, airline details; as well as printing it, email to yourself and parents/friends. 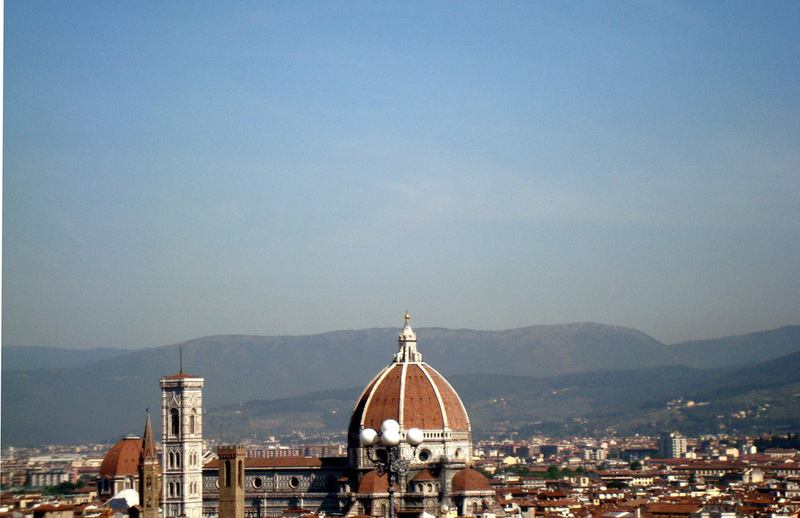 Convert some money at the bank before you leave, say AUD300 into pounds and Euros. Ask for low denominations (5,10,20 notes) so you don’t have to struggle with getting change back. I don’t recommend currency exchange booths – their exchange rates aren’t the best. Use a credit card when possible, and if you need to use the ATM, find one in a well lit public place. Look up destination specific blogs. When planning your itinerary, blogs are a really good resource to seek out as they can give detailed information on the who, what, where, how, why. Honest, first-hand accounts written by everyday travelers get really specific on the most intricate details, especially the watch-outs. e.g. how much to expect to pay for a taxi from the airport; the best train to catch between cities; Metro timetable limitations, surcharges, hidden fees. Learn some key phrases. Write a few key words in the languages you’ll be encountering, and put these cue cards in your wallet, e.g. good morning, thank you, I’m not interested, HELP! Interest in the local language can go a long way – it can be fun trying to converse (with hand gestures too). Museum Passes and Metro cards. Sometimes buying these from home, prior to travel, can give you certain privileges like jumping the queue at those line-riddled Parisian museums.Plus, you’ve just pre-paid so that saves you even more time. e.g. The Museum Pass in Paris – Goodbye crazy long line; Hello Musee D’Orsay! Mobile/Cell Phone. You don’t want to be hit with a huge bill for roaming charges when you get home, so give the phone company a call prior to travel and find out your international options. Pre-book as many hotel nights, train passes, and tours as possible. It’s good to have a framework to travel within – it keeps you on track as time is of the essence. Indulge in the café-culture. 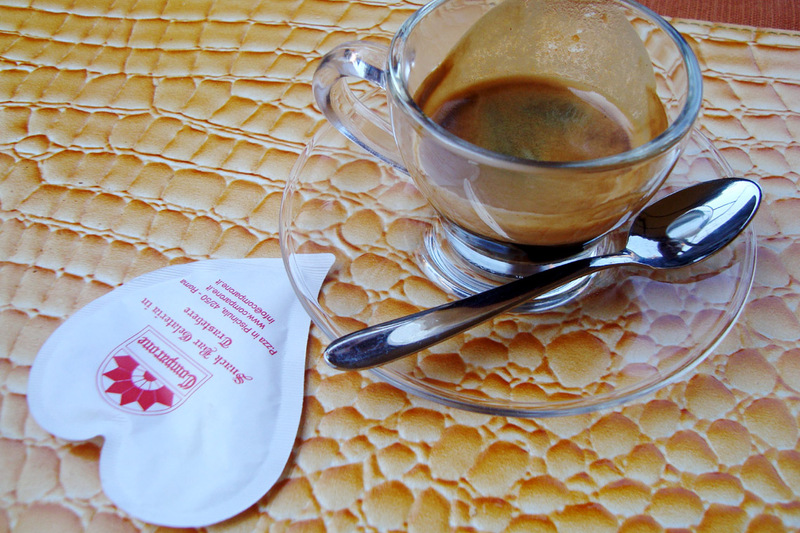 Coffee is necessary traveler fuel! 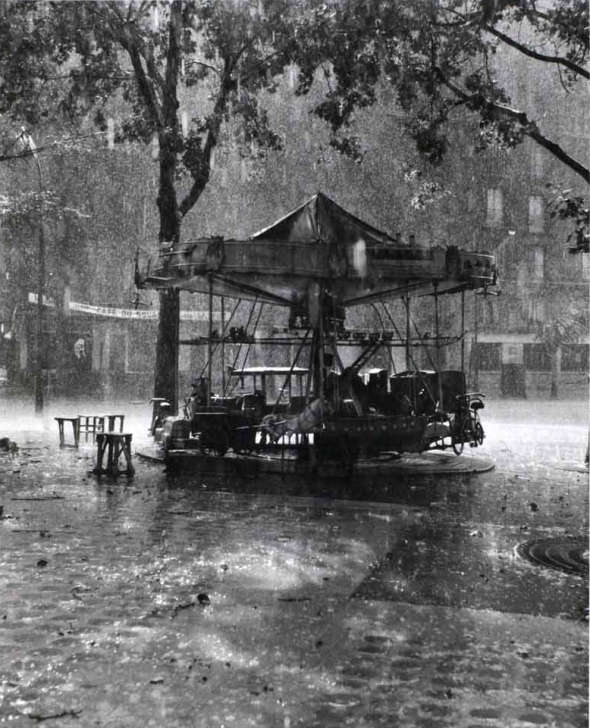 Sit in an outdoor terrace of a Parisian bistro, or stand in an espresso bar in Rome; people-watch; get a feel of a neighbourhood; and, write a postcard (to me!). Always take business cards. From the hotel, café, restaurant, store – just in case you get yourself lost in Europe’s maze of streets, or need to show the address to a taxi-driver who doesn’t speak English. Going out. Hopefully with some fellow travelers, and try and keep it close by to the hotel – double check whether the lobby is serviced 24/7. Watch your drink with an eagle eye. Hotel Tips. Ask for a room that isn’t on the ground level, use the safe to stash your valuables, befriend the concierge – they are an invaluable source for maps, tour recommendations, and getting you in to a restaurant. If you can sense trouble. If you feel that someone may be following you – enter a store or café to surround yourself with people that could potentially help you out. Keep in touch regularly. Buy a phone card from each country; find out where the Internet cafes are (preferably, there is Internet access in your hotel). Call your mother, she worries! Email you sister, she worries too! NB: Security lines at the airport – remember to wear hole-less socks and easy to remove shoes; the less metal on you, the better; buy that bottle of water after you’ve cleared the line. Most importantly, relax and have a great trip. Bon Voyage! 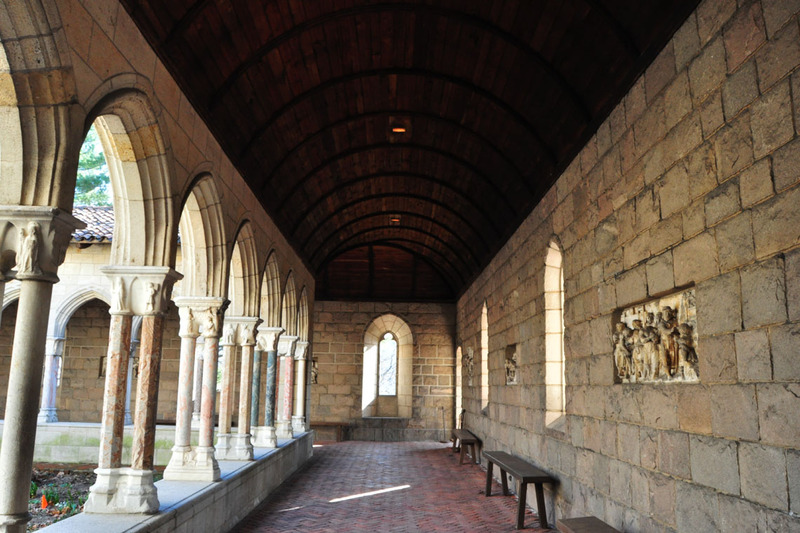 The Cloisters is “the crowning achievement of American museology.” ~ Germain Bazin, former director of the Musée du Louvre in Paris. Considerable effort goes into piecing a puzzle together. Yet the challenge for architect Charles Collens was far greater, especially since some of his pieces were missing. Not only that, but his task called for combining five incomplete sets and assembling them into one. 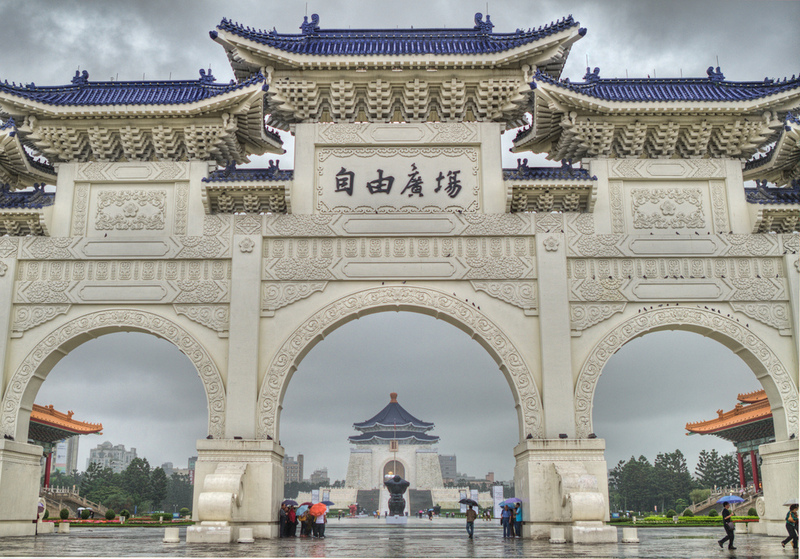 The result of this feat was realized in 1938 upon completion of the structure; one that wouldn’t look out of place in the Middle Ages. 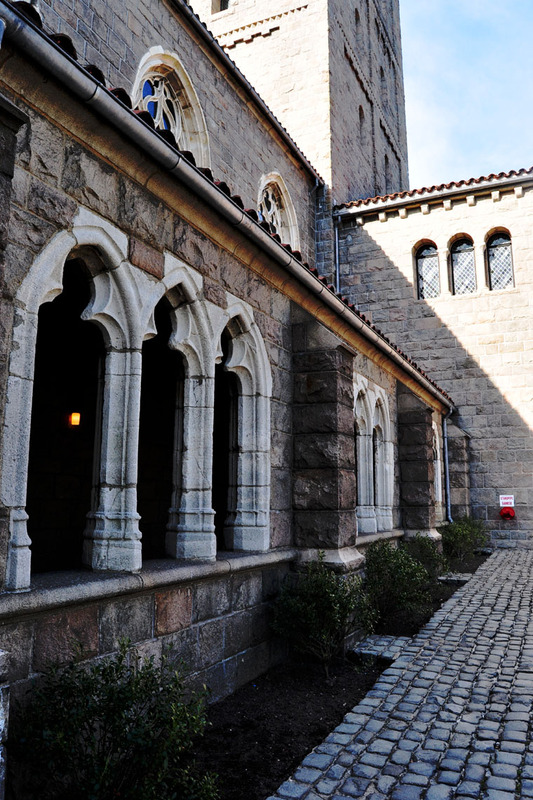 Collens was the visionary behind The Cloisters – a museum and gardens designed around the architectural elements of five French monasteries dating back to the twelfth through fifteenth century. Loosely based on prototypes presented by medieval monasteries, this is the nation’s largest museum dedicated to medieval art. … whoever does that building would have to work out all the individual exhibits in such a way as to place them to the greatest advantage and given them one setting which would minimize the fact that it was an exhibit, but a part of a composition and naturally fitted into that particular spot best adapted to the conditions under which it existed in its original state. Clearly, he was the right man for the job. 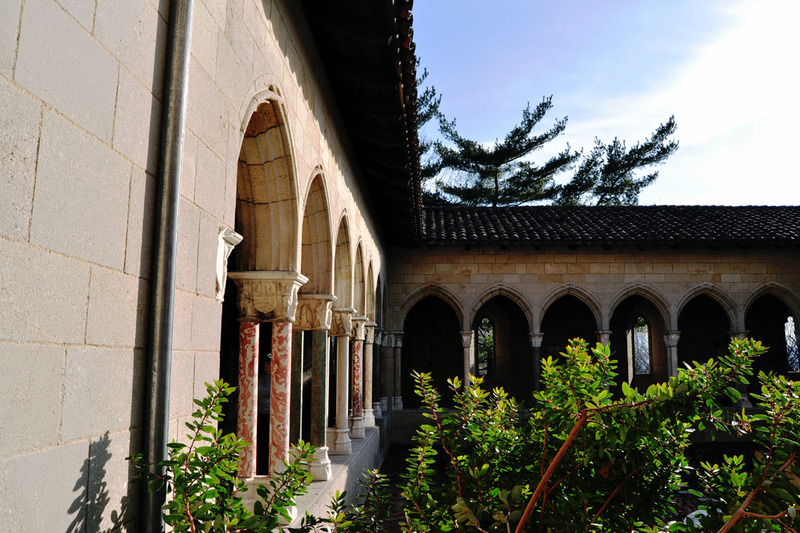 The Cloisters, a culmination of Romanesque and Gothic style elements from southern France, displays authenticism if not purely for its artistic detail and design, but also for the integration of the horticultural elements of the time. 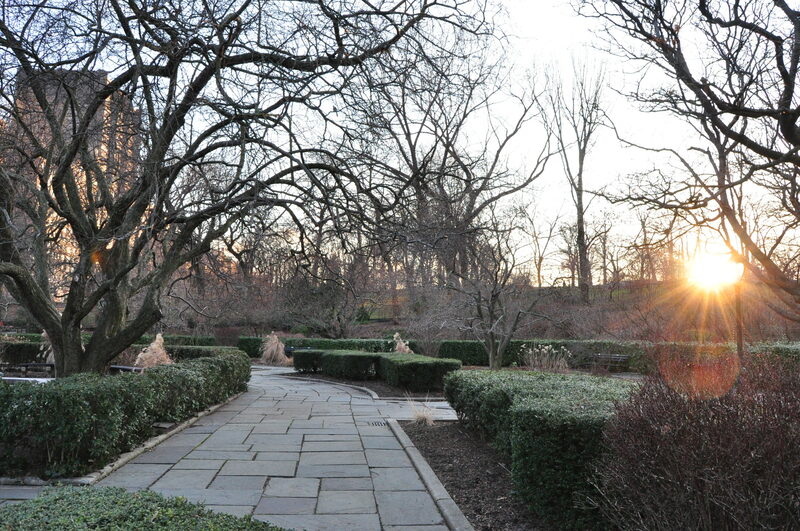 Think: a seamless flow from Cloister, to Garden, to Chapel, to another Cloister. 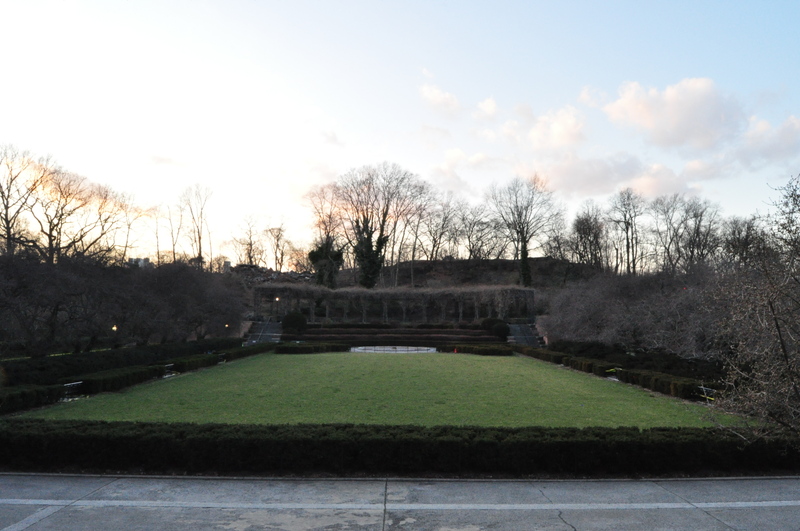 Located in Fort Tryon Park, this extension of the Met Museum sits atop a hill, in keeping with the medieval precedent. 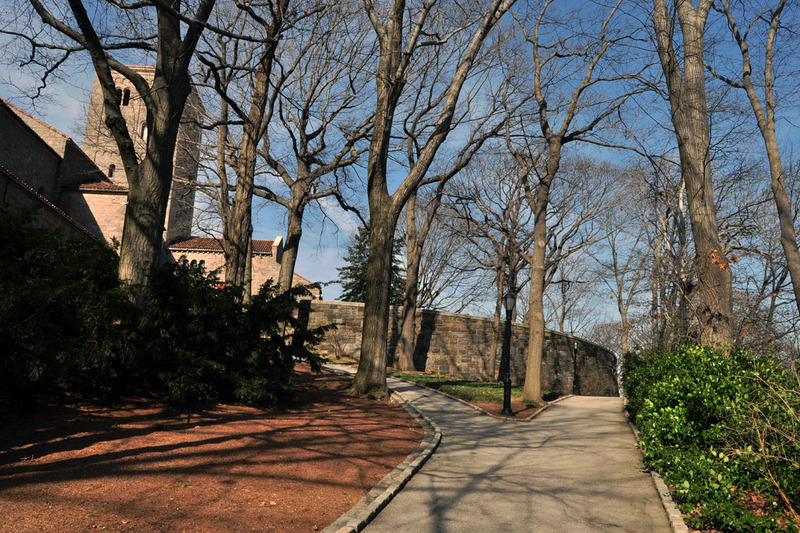 Remember those unobstructed views of the New Jersey Palisades from Fort Tryon Park provided by Rockefeller? 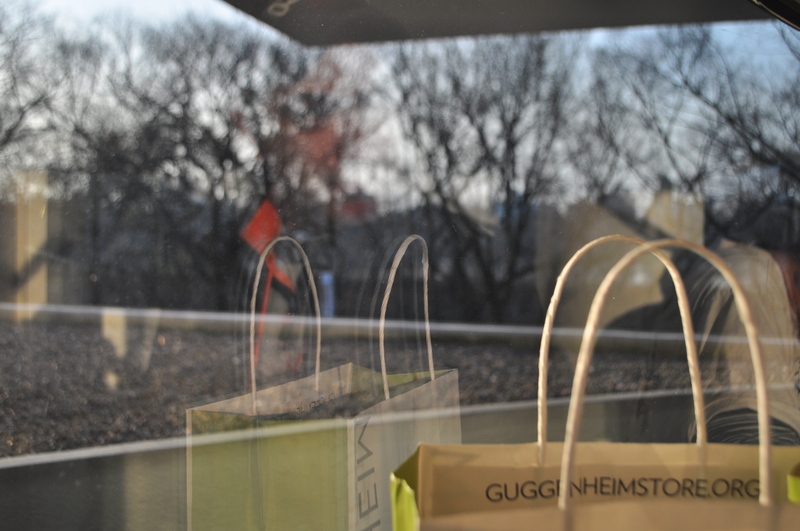 The can also be enjoyed higher up, from the museum’s terraces. Medieval monks often built themselves walled compounds on mountaintops, the better to keep their vows of retreat from the world. 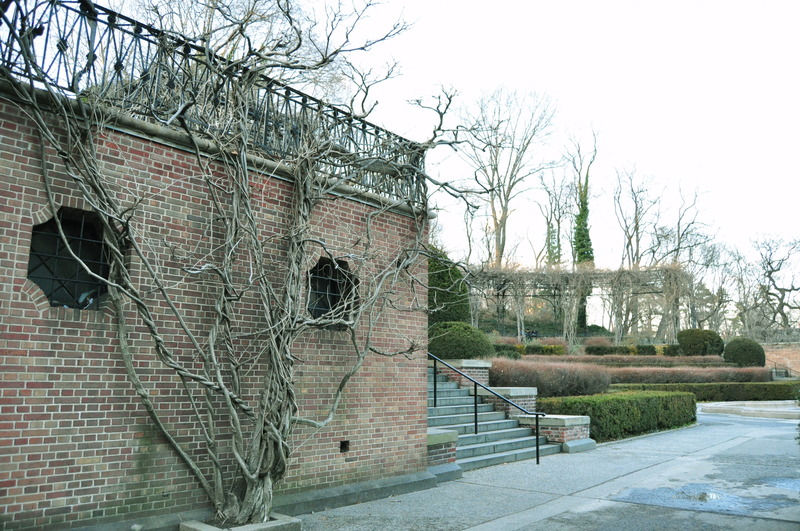 Rockefeller subsequently donated his acquisition to the Metropolitan Museum of Art, though the problem of space necessitated the construction of a building to house the artifacts. Enter architect Charles Collens. In harmony with Collens’ design, curators Joseph Breck (Assistant Director at the Met), and James Rorimer (Curator of Medieval Art) created in the galleries a clear and logical flow from the Romanesque (ca. 1000-ca. 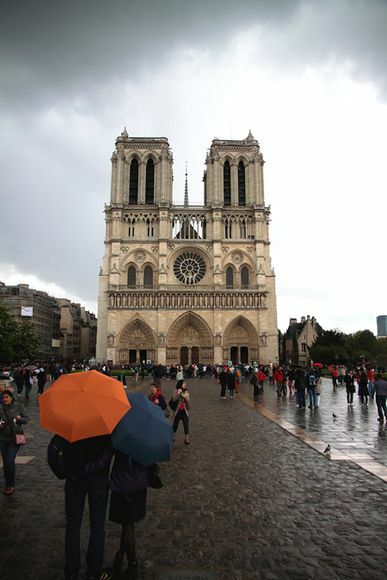 1150) through the Gothic period (ca. 1150-1520). 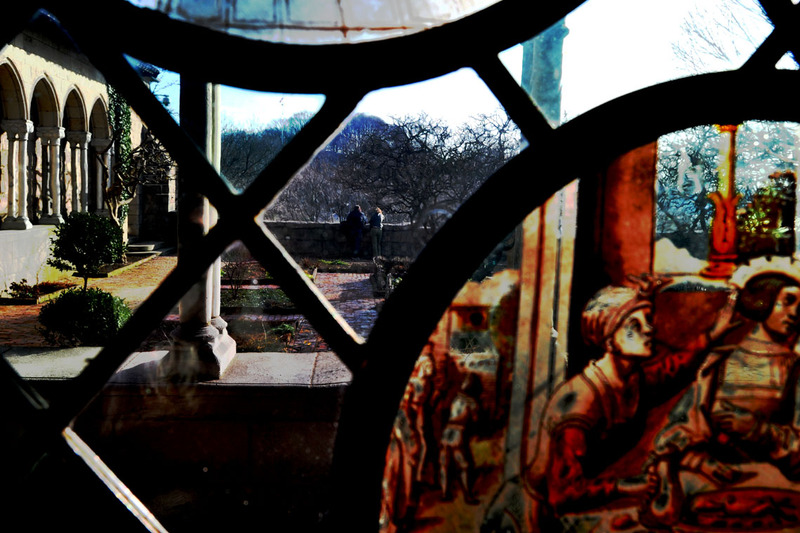 Today, these artifacts form the core of the collection displayed in The Cloisters. They are accompanied by gifted artworks from Rockefeller, whose endowment in 1952 made further acquisitions possible, such as the Unicorn tapestries and Pontaut monastic Chapter House. So named The Cloisters for the five French monasteries, each forms part of the museum’s framework and occupies a unique position in the building. 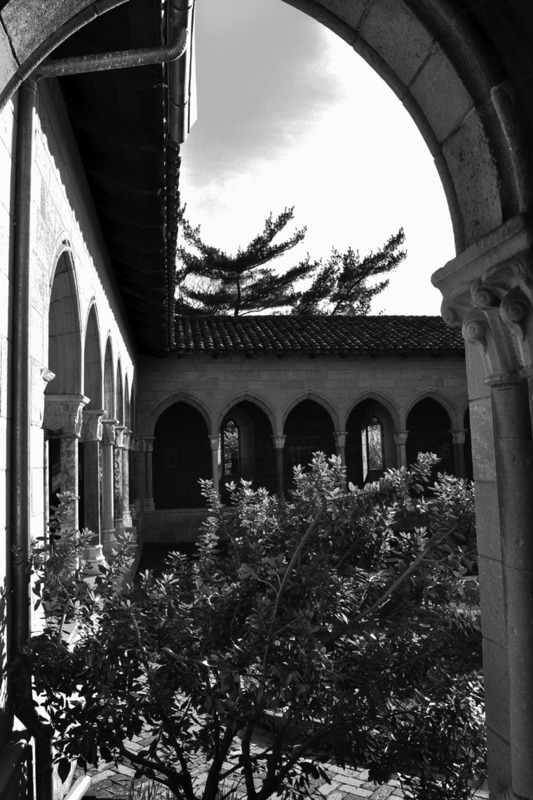 CLOISTER, Defined: The cloister is the heart of the monastery. It consists of a covered walkway surrounding a large square or rectangular open-air courtyard, with access to all other monastic buildings. Usually attached to the church, a cloister was at the same time passageway and processional walkway, a place for meditation and for reading aloud. A garden with a water source was usually located within the cloister. At once serene and bustling, the cloister was also the site where monks washed their clothes and themselves. 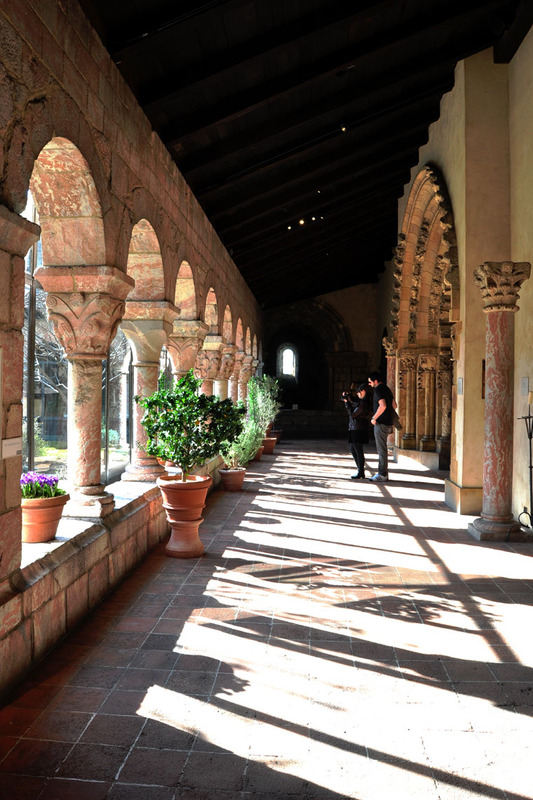 Note: The Cloisters is a designated ‘Quiet Zone’ and there are no monks bathing in the courtyards. The museum is recognised by its four-story tower that greets you upon arrival. 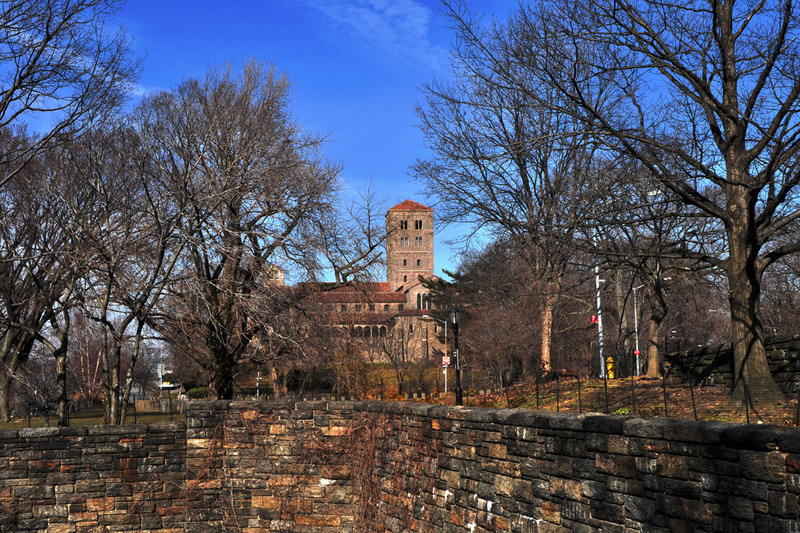 Modeled after the Benedictine monastery of Saint-Michel-de-Cuxa in the Pyrenees, you may have noticed this square turret from many vantage points in Fort Tryon Park. NB: This walkway features the characteristic Cloister arcade though no courtyard. You’ll enter through a set of wooden arched doors with cast iron detailing, and into the Froville arcade. Look out through one of its nine pointed arches, sans window panes – these were originally part of the 15th C priory. Notice the giant holly tree directly outside. 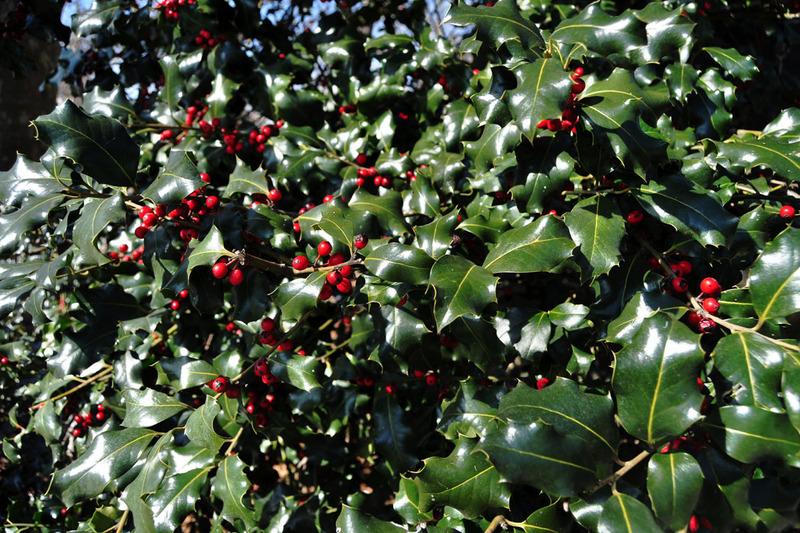 Holly, native to most parts of south and central Europe, was credited by the Roman natural historian Pliny with the power to protect and defend against witchcraft, lightning, and poison. NB: The elements are from the mid-12th Century and whilst the cloister is proportionately the same, it is roughly a quarter of the size of the original, located in the Pyrenees. Yes, a part of the Cloister survives at the monastery and is home to a community of monks. This is the heart of the museum; you basically have it to yourself. 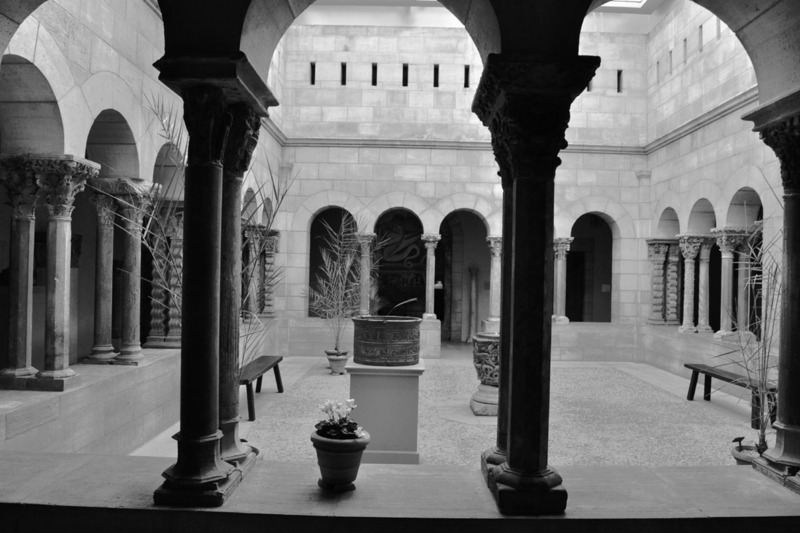 The cloister consists of an open-air courtyard, encircled with a covered walkway supported by original columns of native pink marble, carved with plant and animal motifs. 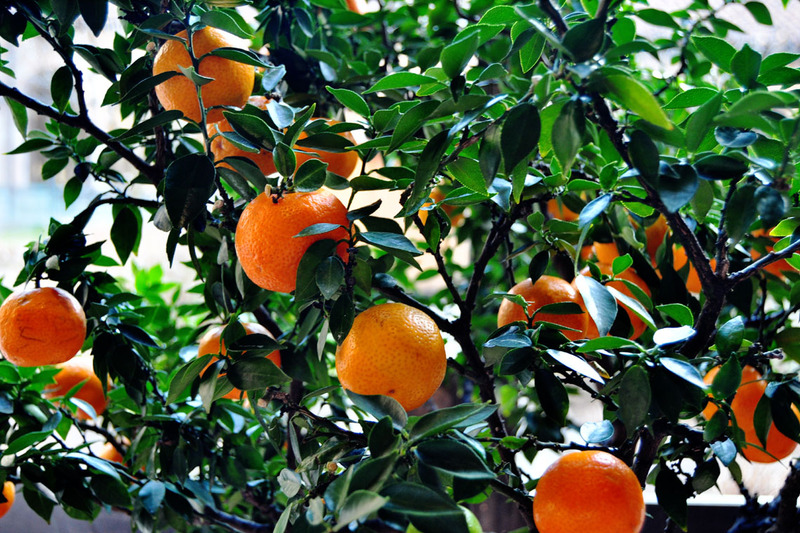 In these cooler months, their open arcades are glazed with glass; the terracotta potted bitter orange, rosemary, and bay laurel plants are brought in from the outside. 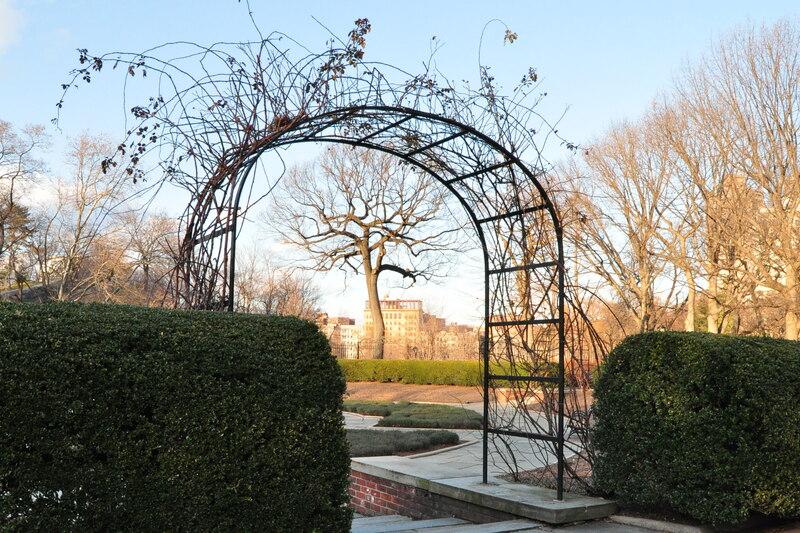 Jasmine, fig, and even lavender are hardier and stay put in the ornamental garden, along with planted and pruned crab apple trees. There is evidence that tender plants were grown in pots and brought into shelter in northern Europe, and Albertus Magnus, the great thirteenth-century philosopher and natural scientist, is said to have astonished visitors to his cloister in Cologne, where flowers and fruits flourished in January. Enjoy the last of the seasonal adaptation: notice the citrus trees adorned with oranges and tiny lavender bushes lining the interior pathways; take in the scent of thyme and rosemary. In the mid afternoon sun, the shadows of pillars and archways decorate the passageways. 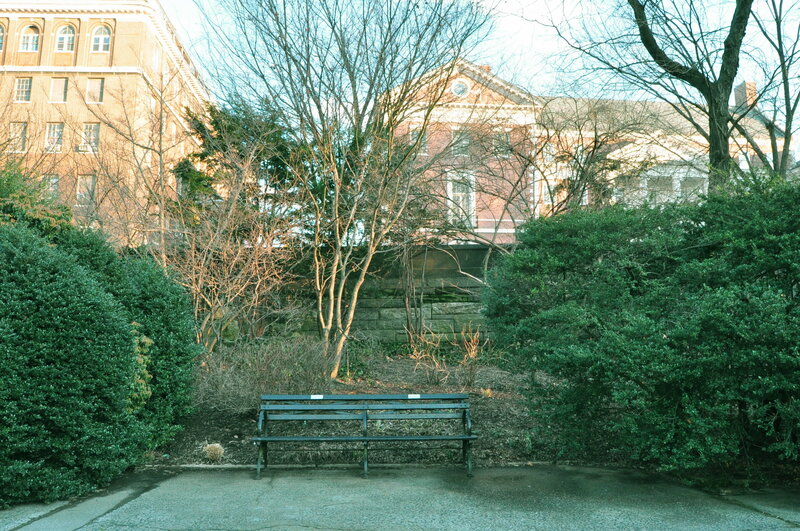 There are benches available should you like to take a seat and admire the first of the blooming daffodils. 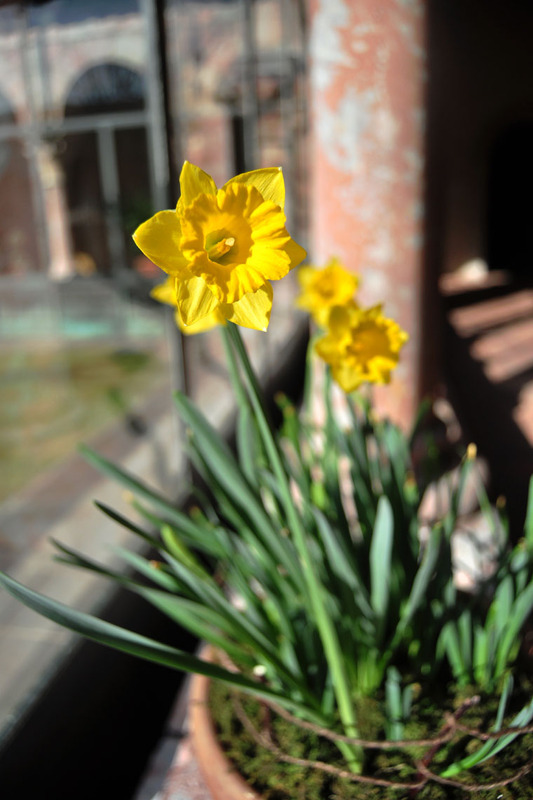 The common daffodil, Narcissus pseudo-narcissus, often appears in medieval art; the form is readily recognizable, even when stylized. It is the only trumpet-flowered narcissus species known to the Middle Ages, and both the cup and the petals that form the corolla are yellow. NB: this abbey became an important site on one of the pilgrimage roads that ran through France to the holy shrine of Santiago de Compostela in Spain. You’ll enter a smaller courtyard – its walkway windows look out onto the Hudson River; a skylight provides natural illumination and potted palms provide a dash of green. Look, don’t touch… Impressive are the double columns, decorated by use of drilling techniques and deep undercutting. Note the Romanesque palm, figurine, blossom, and acanthus leaf motifs all around – spiny and decorative foliage – as well as pillars of undulating forms. In the centre of the cloister stands a fountain; immaculately carved, it dates back to the 11th Century and comes from Auvergne or Buyenne region of France. A plant of ancient cultivation, grown for some five thousand years and with an equally long presence in art and architecture, the date palm was and is both economically and symbolically important. Date palms have provided an important food, intoxicating liquor, a sweetener, and a building material. Damaged during the French Revolution, there are no details as to the abbey’s original size and look. The columns and shafts are original, and a portion of the cloister remains at its former site in Montpellier. NB: Long thought to be part of the Bonnefort abbey, the elements instead come from other monasteries in the region including Tarbes. 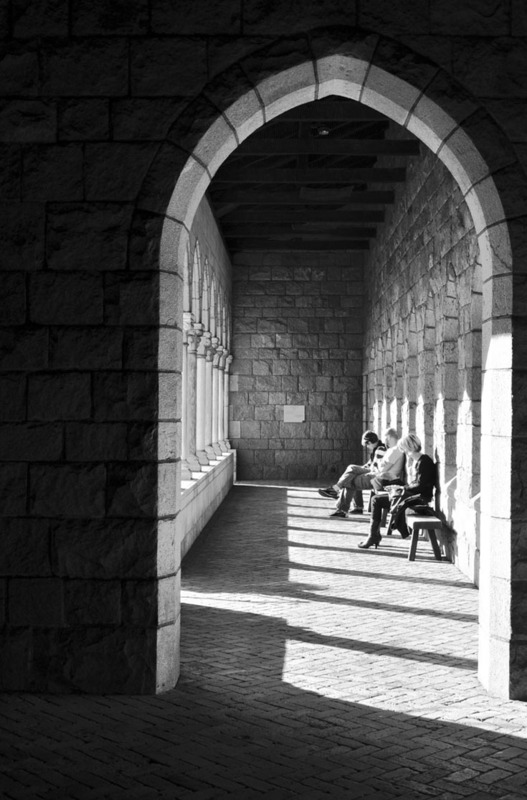 You’ll immediately notice the benches that line the northern wall of this cloister; a welcome respite and an opportunity to catch some of those warm afternoon rays. 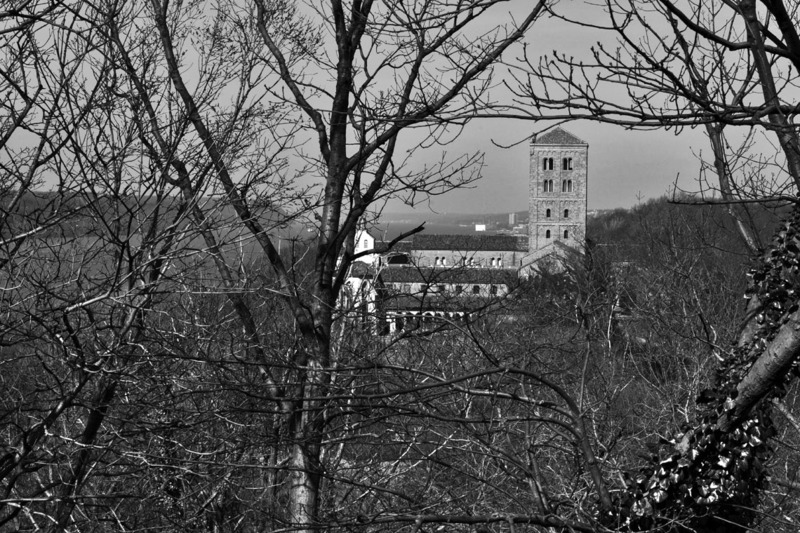 This is the only cloister visible from building’s exterior; the views from here look onto the Hudson River and Fort Tryon Park. The twenty-one twin columns that support the arched walkway are comparable to the cloisters located in the Toulouse area. 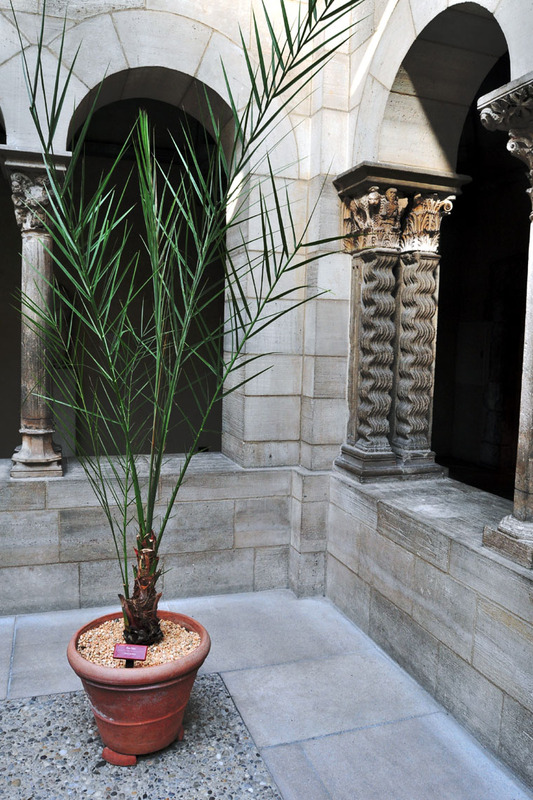 Admire the pillars, decorated with foliage motifs; they complement the courtyard’s medieval garden – the main teaching garden, home to the greater part of the medieval plant collection. 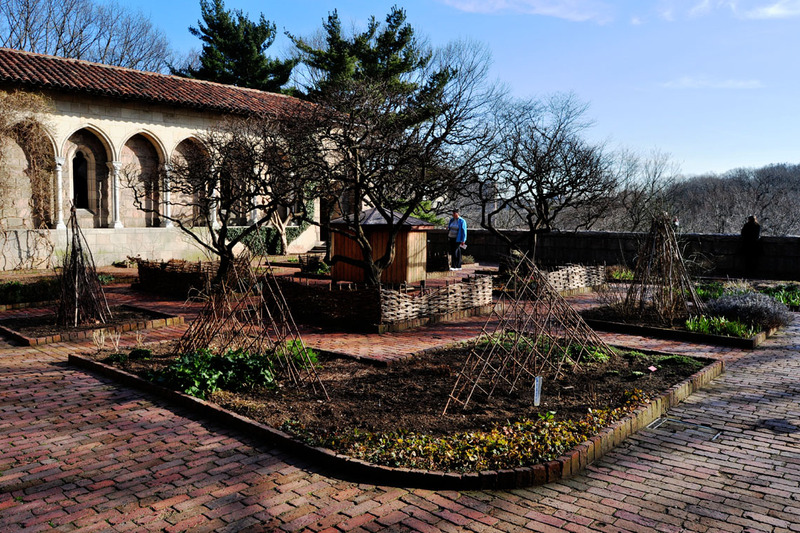 The layout of the Bonnefort Cloister garden approximates that of a medieval herb garden, with raised beds bordered by bricks and wattles fences. Grouped and labeled according to their medieval usage – magic, household, medicinal, culinary, textile dyeing, manuscript painting – all of the plants grown in the garden are species (over 250 of them) documented in medieval sources. 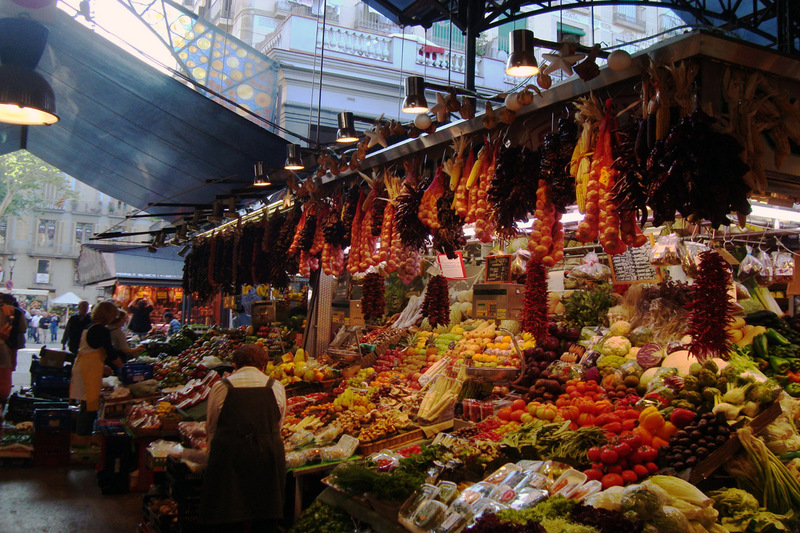 Plants and herbs used to ward off spirits and other superstitions! “Wine and wine grapes were of great economic and symbolic importance in the Middle Ages. Vineyards were associated both with royal and noble estates and with monasteries. 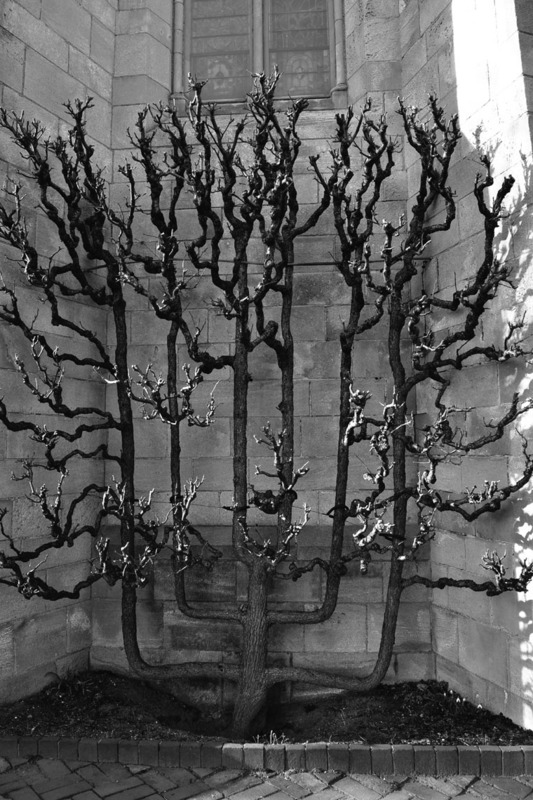 There was once a trellised Concord grapevine on the west wall of the garden, but the younger of two espaliered pears now grows in that spot. NB: During the warmer months, this area would be ideal to sit in whilst sipping on a coffee. Unfortunately, March still qualifies as the off-season; the café is closed. From Bonnefort, walk through to this adjoining cloister. Terracotta tiles, peaked arches, and columns were salvaged from the Carmelite convent; the cloister, as it appears here, wouldn’t look out of place in Tuscany or rural Spain. You’ll notice religious scenes and coats of arms – attributed to families in the area of the convent – carved into its stone walls and pillars. The medieval garden, planted as a single field of herbs and flowers, evokes the background art of the Unicorn tapestries. 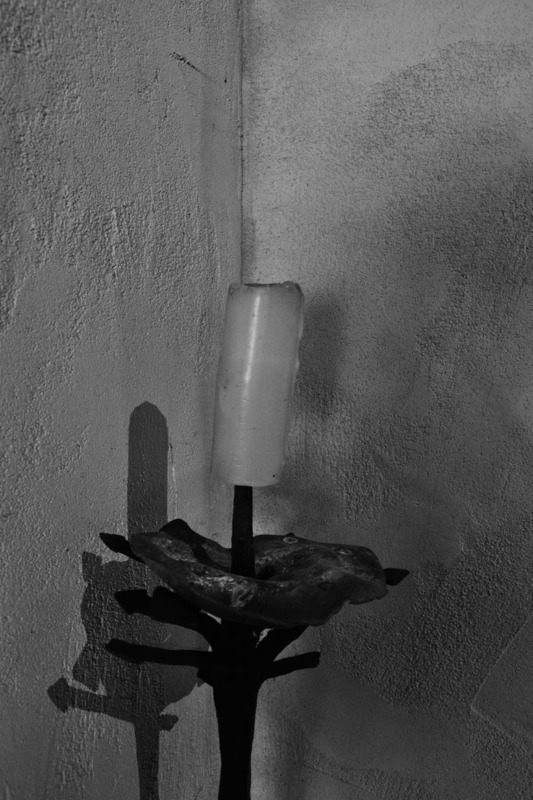 … the cloister formed a continuous and solid architectural barrier… “that effectively separates the world of the monks from that of the serfs and workmen, whose lives and works went on outside and around the cloister. 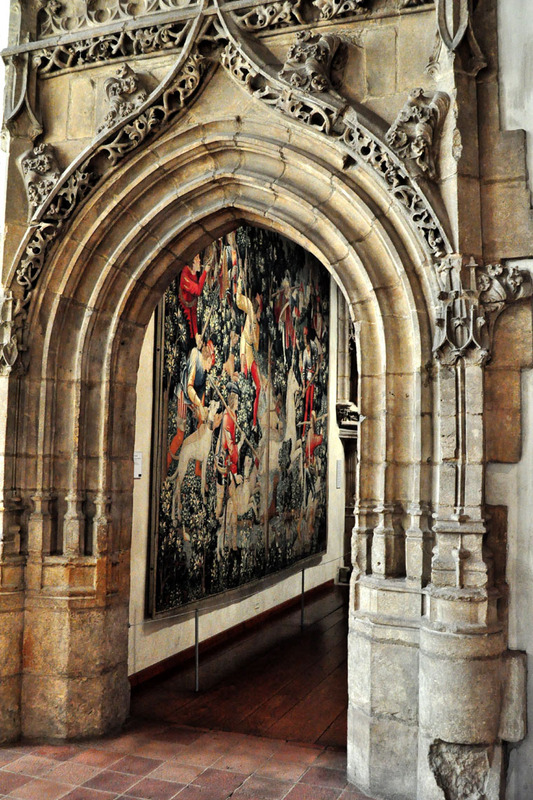 Join me on the final leg of this tour, when I uncover the other parts of The Cloisters – those Unicorn tapestries, the Treasury, the Chapels, and some stained glass windows – in Part 3. 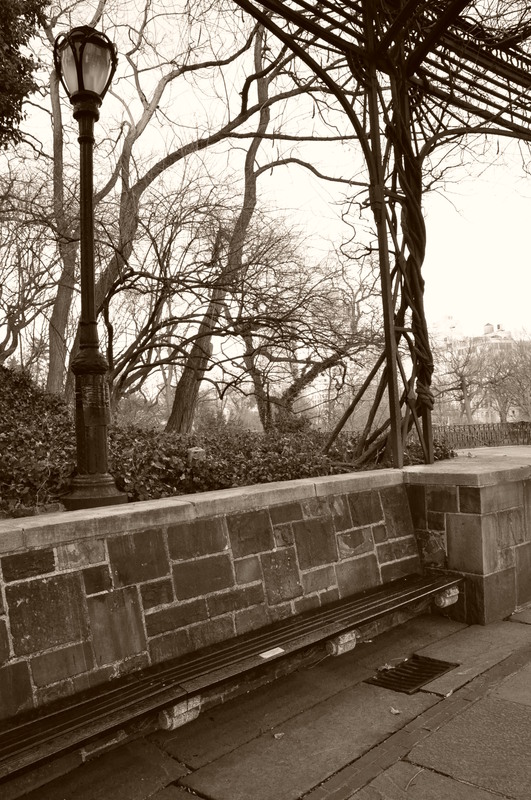 Michel Legrand’s quote sums up how I feel about Central Park. 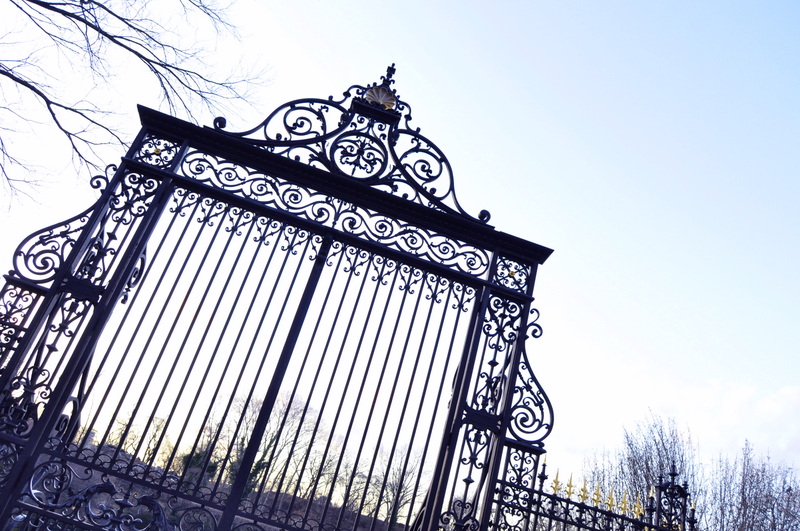 The more I see the less I know, I thought as I left through The Conservatory Garden’s beautiful cast-iron gates yesterday and into the commotion of Fifth Avenue. 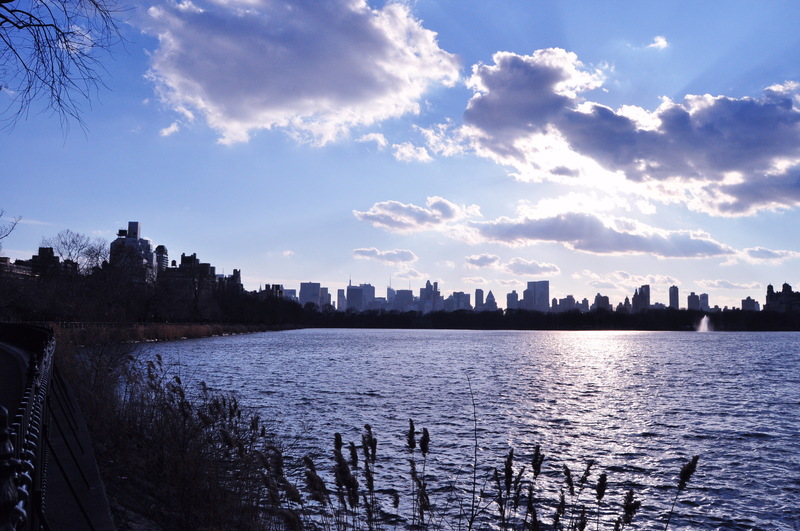 The silhouette of Manhattan from the northern end of Jacqueline Kennedy Onassis Reservoir. 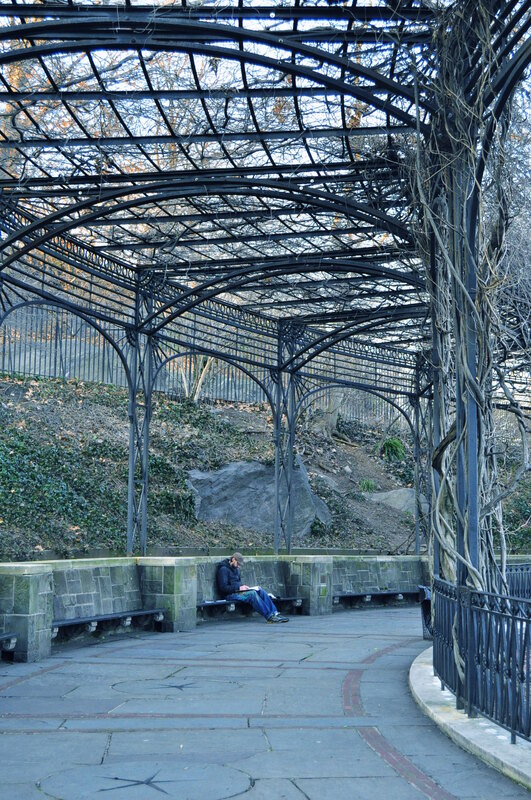 Of his favourite spots to visit in Harlem, celebrity chef Marcus Samuelsson singled out “the Conservatory Garden in Central Park just off East 105th Street.” I’d filed this mention in the back of my mind. 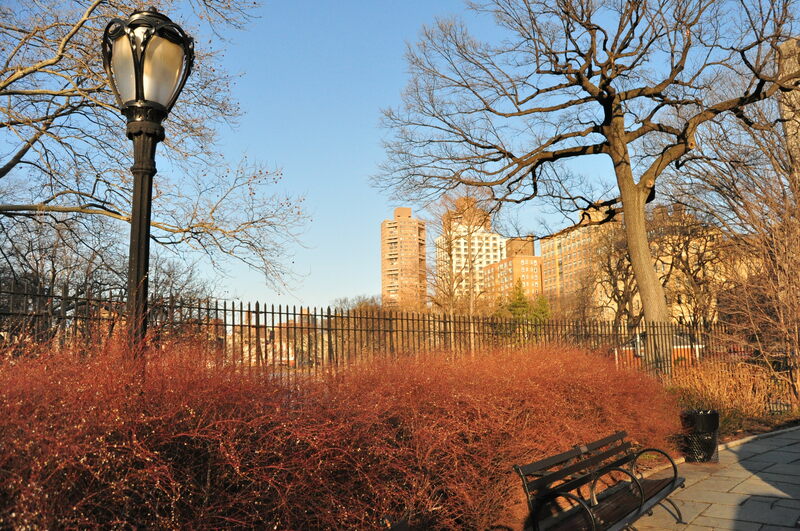 February, the first: a warmish (59F) winter’s day in New York, a day to make an uptown trip to Central Park North. 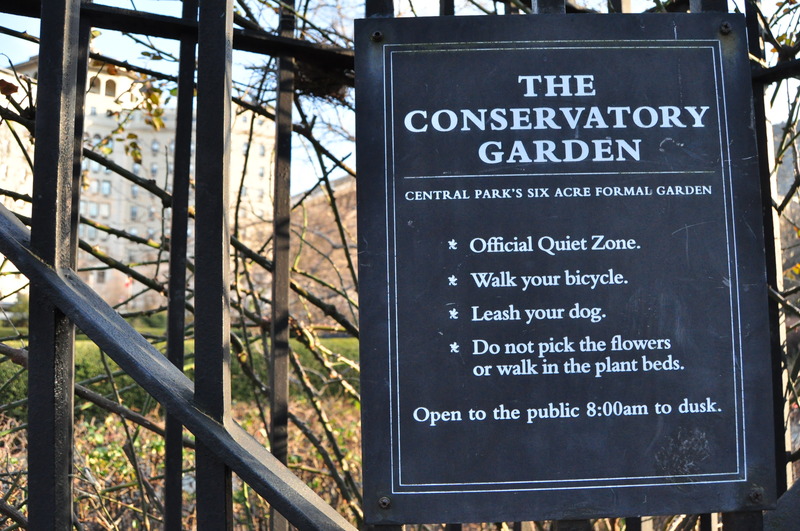 As I hadn’t done any prior research, I thought The Conservatory Garden resided in a greenhouse. Not so. 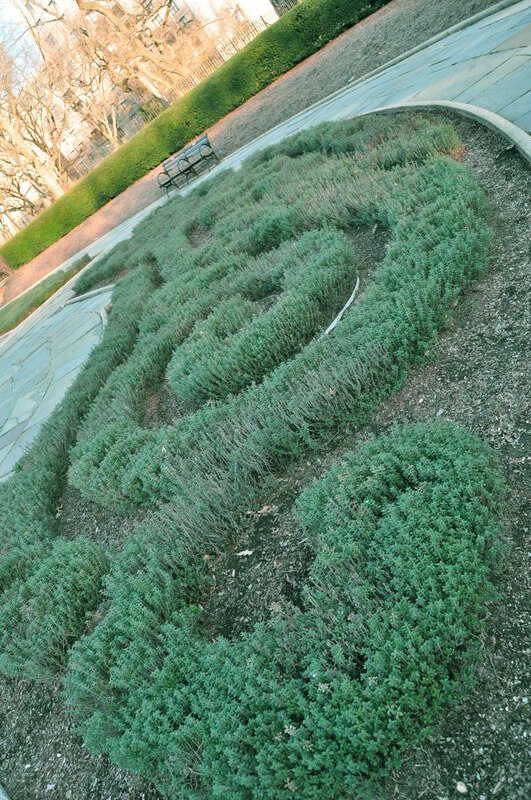 Six acres of outdoor gardens define its expanse, a triad of stylized gardens, influenced by France, England and Italy. A little bit of Europe in NYC. 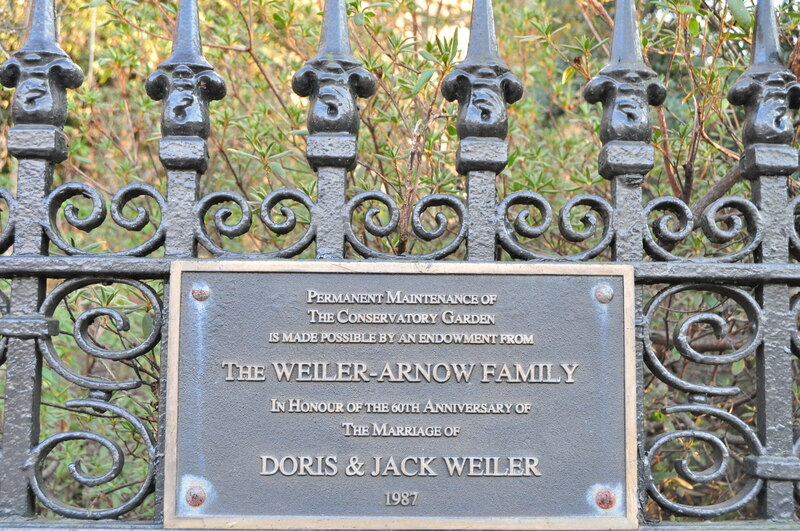 I hope you enjoy The Conservatory Garden through this pictorial. Oh, and prepare yourself mentally to enter an “Official Quiet Zone”. As an aside, I would like to dedicate this post to my few bloggers: Vidal’sNYC for nominating me for the Versatile Blogger award. 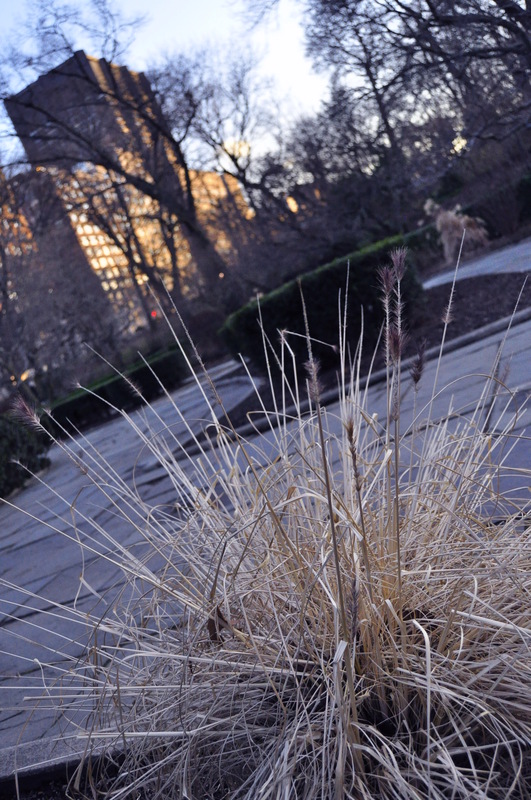 I hope you may check out Vidal’s photo-glimpses of New York as he sees it. 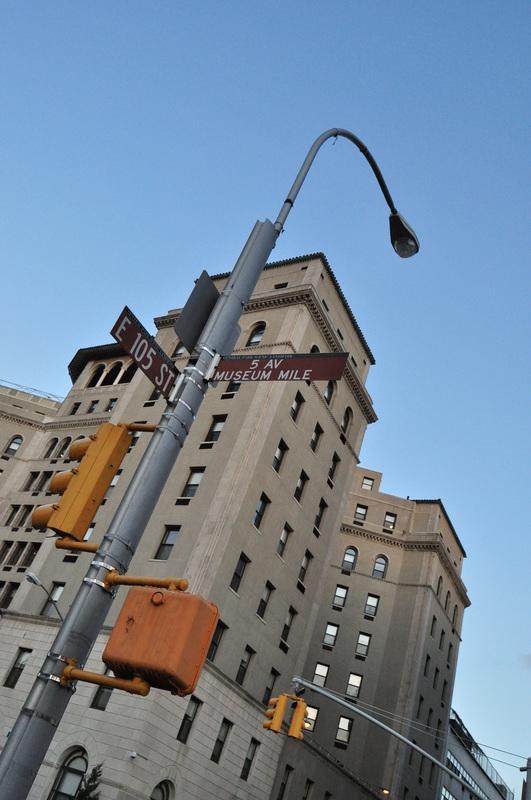 I’m also so appreciative of the support by robertoalborghetti and MiltonJohns Photography for reblogging my posts on Letting Love Rule @ Radio City Music Hall (Lenny Kravitz) and Gated Abandonment on Bowery ~ downtown NYC. I am really humbled by your kind comments and thank you for your inspiration. 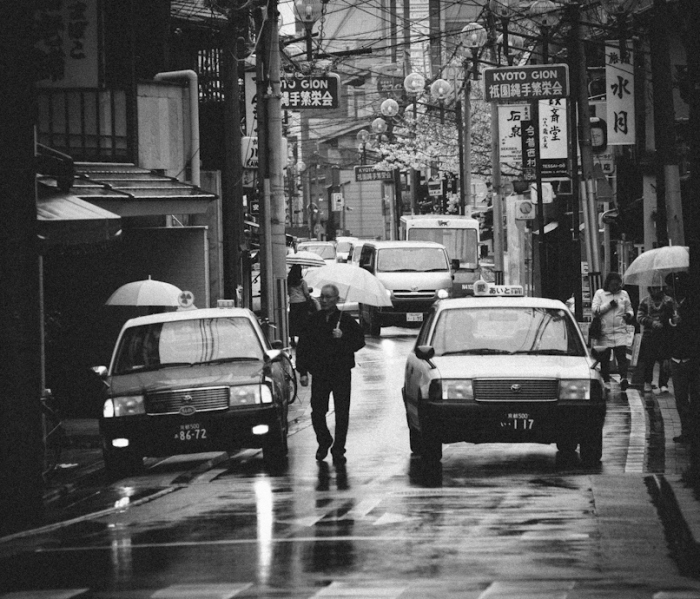 I hope you may check out the photography and art portfolios of all three bloggers. I’m a keen follower of their work and hope you will be too. The French inspired part of the Garden, at its northern end. Fountains stand empty for now. 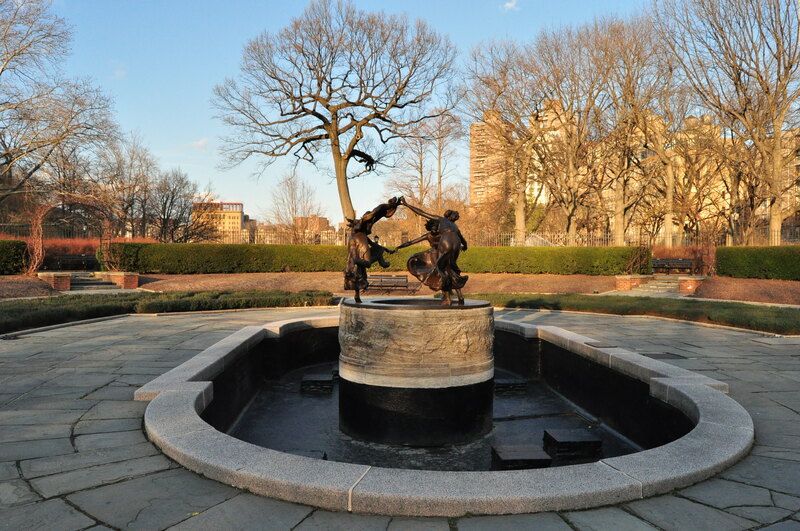 Dancing Maidens sculpture by German artist Walter Schott. Manicured hedges and patterned green. 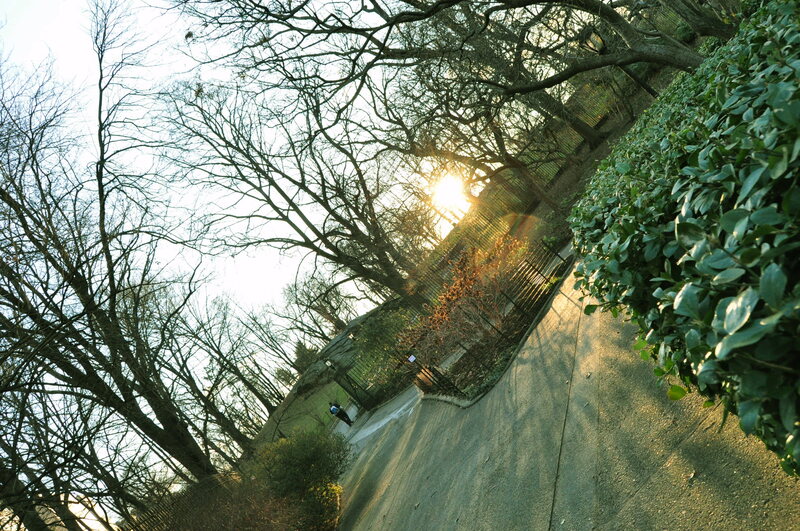 Winter’s calm beauty: still trees, a late afternoon sun, long shadows. 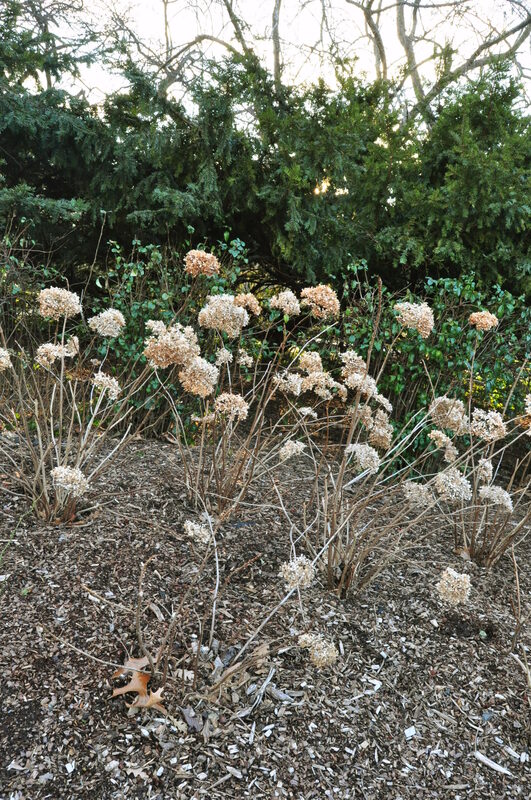 Hibernating hydrangeas; sleeping beds of roses..
A stream of late-afternoon sun rays. The English-inspired part of the Garden, to the south. 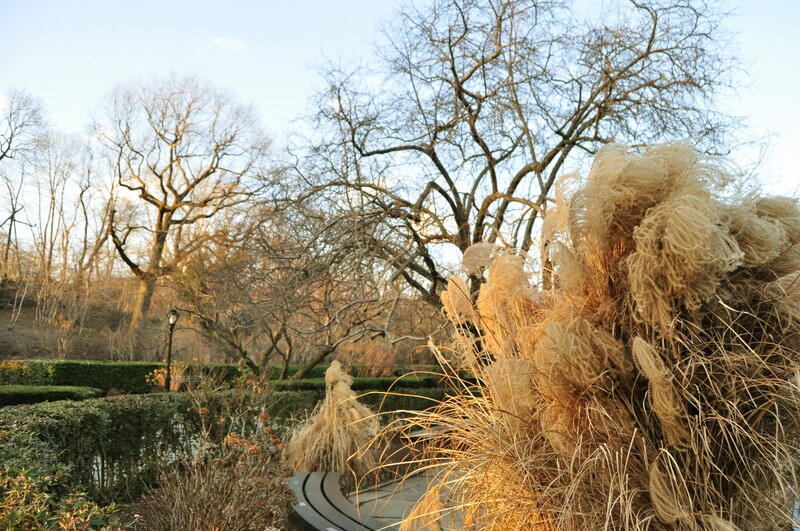 Grassy furry plants remind me of Mr. Snuffleupagus from Sesame Street. More puppet reminders, this time of those crazy hairstyled muppets on Fraggle Rock. Do you remember? 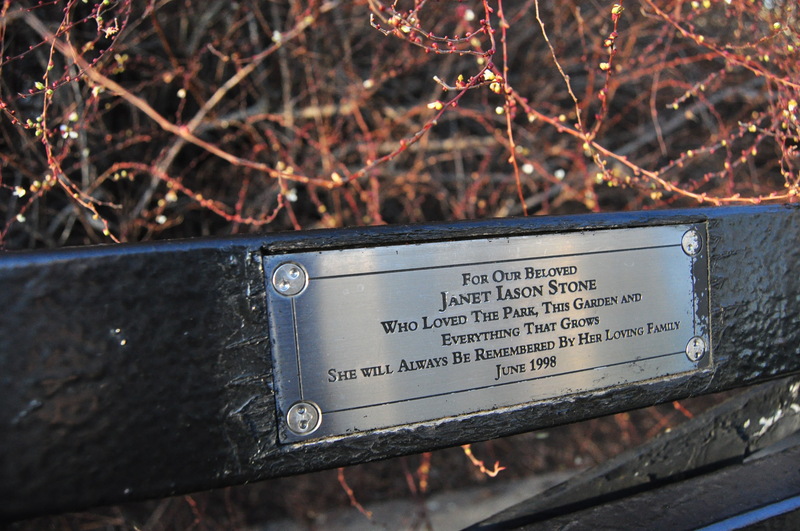 The English part of the garden is based on Frances Hodgson Burnett’s classic, The Secret Garden, but it is so Jim Henson inspired. Early bloomering jonguils. 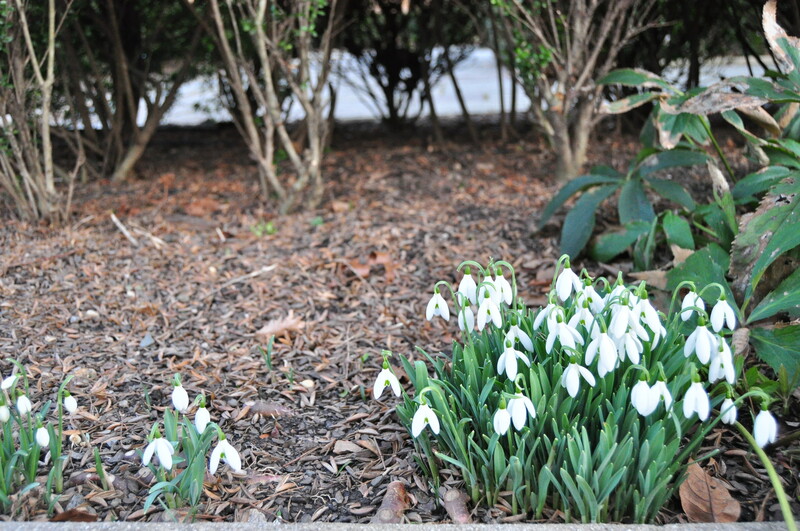 Perhaps spring is closer than we think. The Italian-inspired garden, in the Conservatory’s centre. 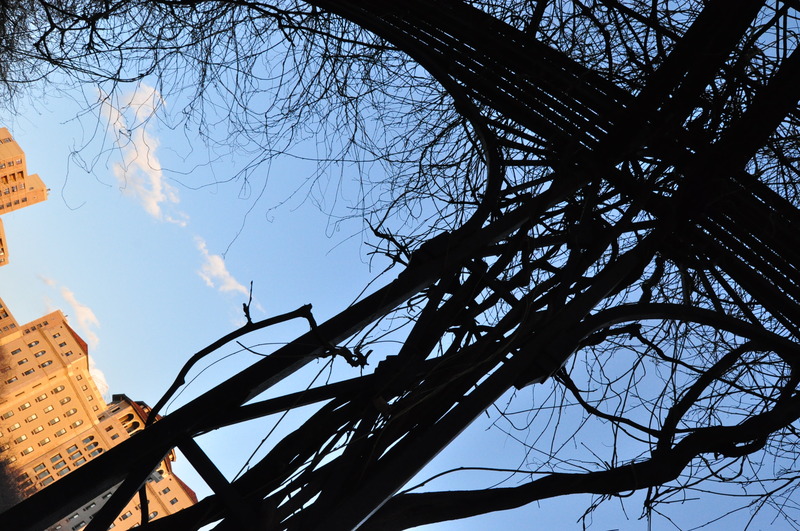 Entangled Chinese wisteria against a Fifth Avenue view. 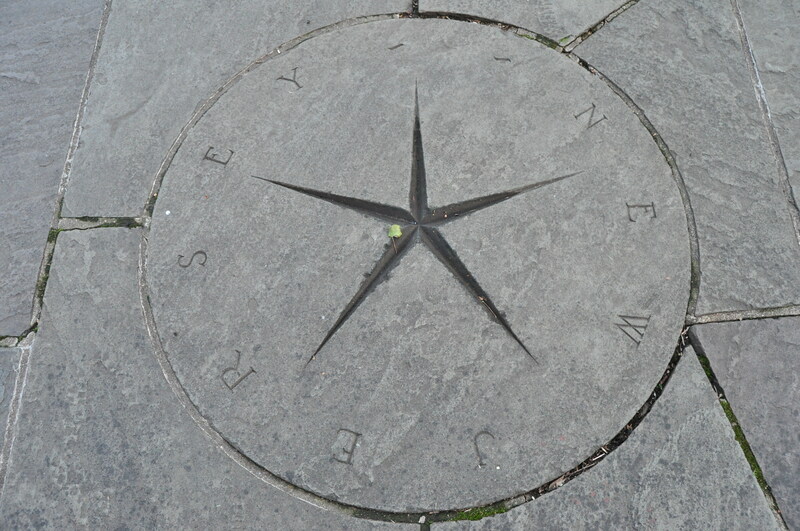 A touch of history : the original 13 states engraved into tile. 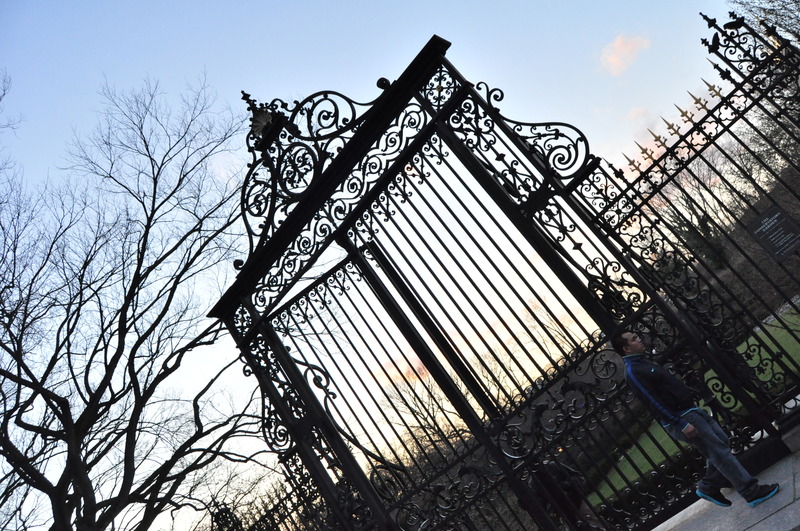 At dusk, the grand gate must close. Recently I came across a quote by Paulo Coehlo that r motivated me to curate part six of the Bolt of Inspiration Series. 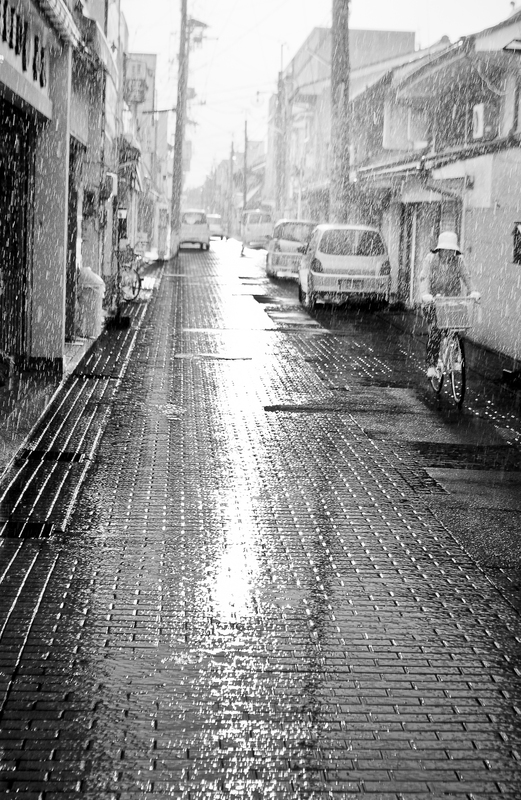 I’d also like to dedicate this post to fellow bloggers, My thoughts, pics and personal opinions and thoughts and rainstorms. Both nominated me for the Versatile Blogger Award – thank you! 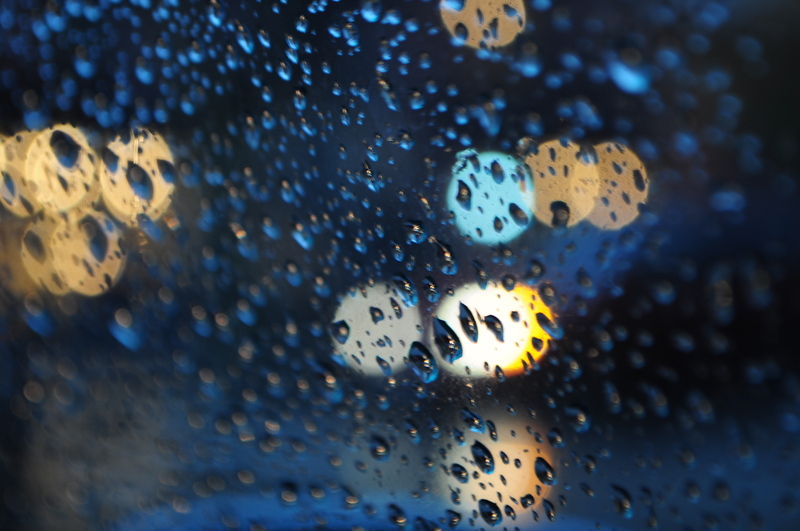 These two wonderful blogs make me smile, laugh and inspire with their words and insights. 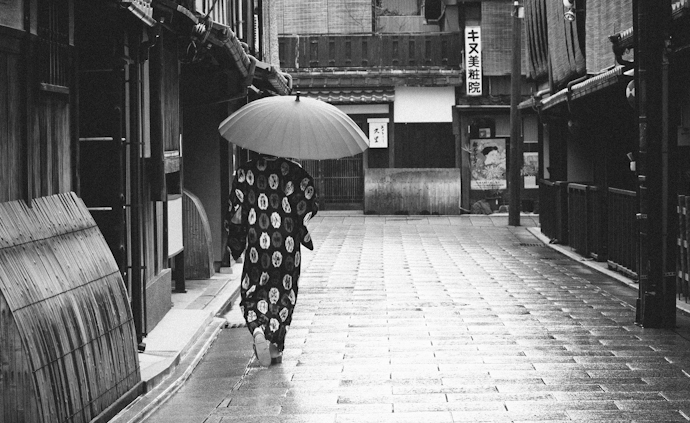 As I recently posted on receiving The Versatile Blogger Award from Victor Ho, I thought I’d spread the love by sharing a selection of inspiring quotes and images – many of the photographs taken by very talented and well traveled photographers in the blogosphere. I hope you check out all of these blog links! 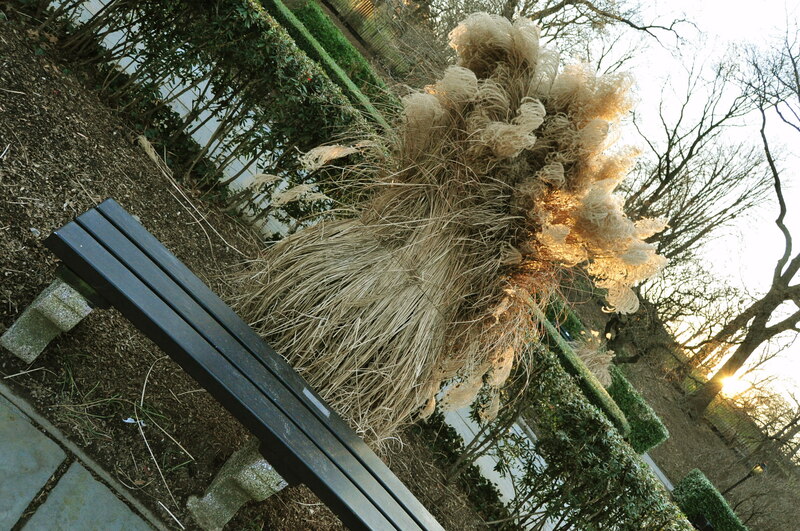 It’s hard to stand out in New York And if you do, you’ll usually have something exceptional to show for it. 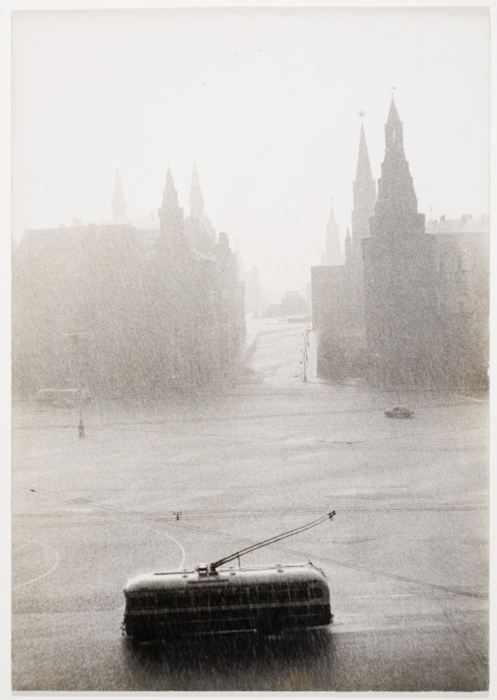 Such is the case with the city’s architecture; such is the case with its art. 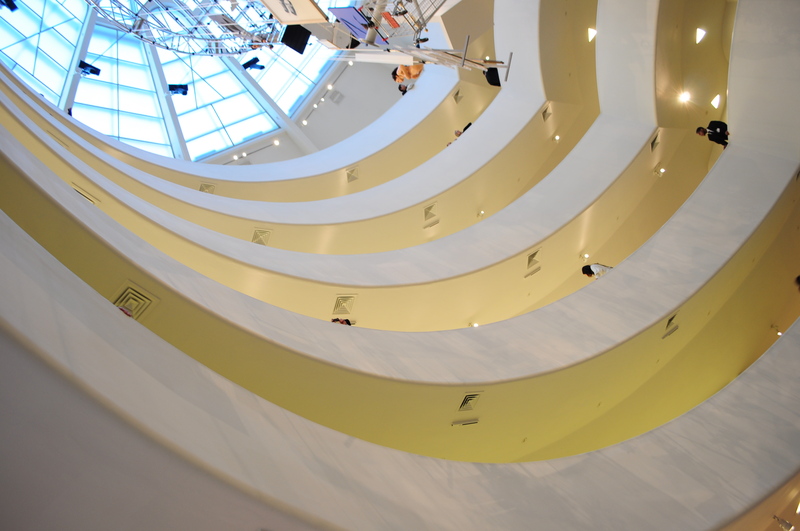 The Guggenheim Museum has been around for over half a century. 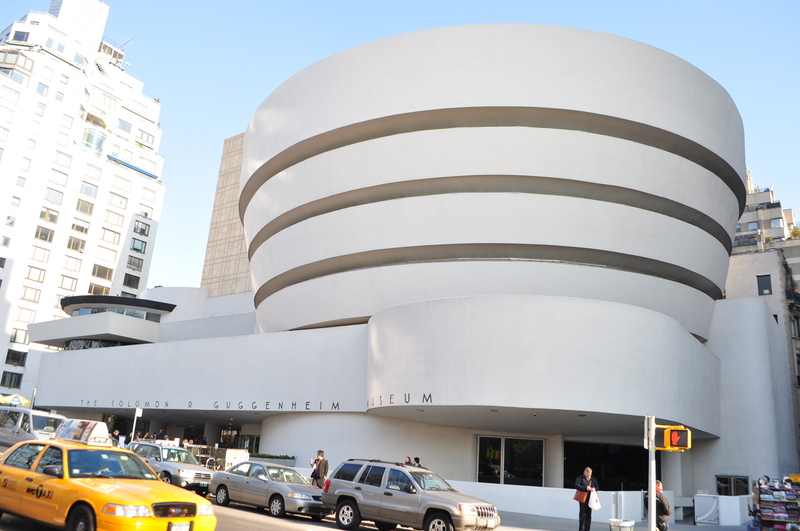 A celebrated institution, the building is an artwork unto itself, subjected to a fair amount of controversy. Some say that Frank Lloyd Wright ‘designed his building as an asymmetric nose-thumbing at the rigid order of New York’s streets and architecture’; others believe that he was an architect ahead of his time. 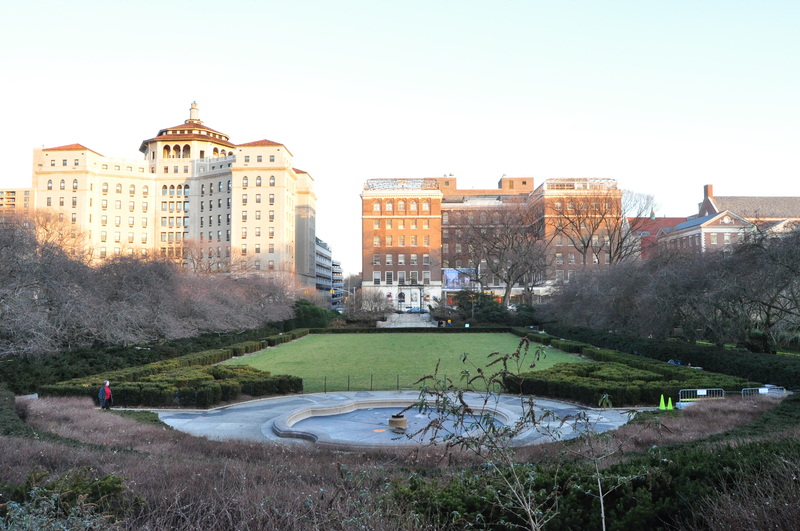 A contested expansion in 1992 (a rectangular annex was added to the museum’s backdrop) provoked further outrage and debate. 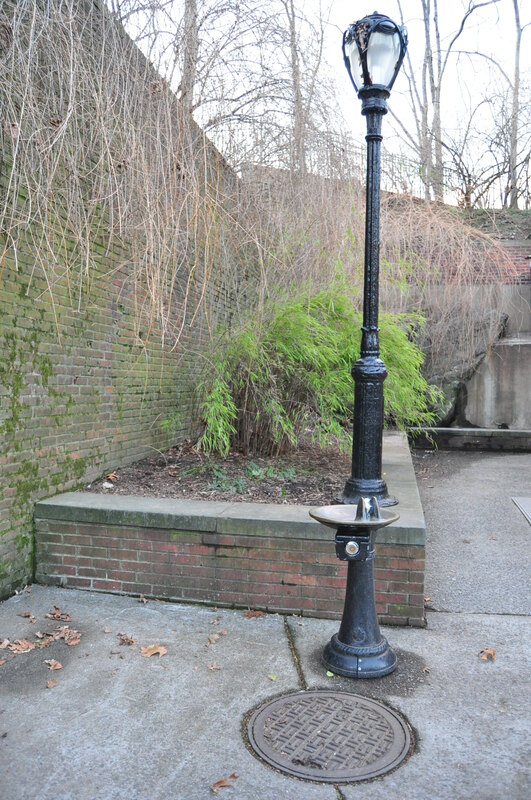 Woody Allen likened its new look to a “giant lavatory basin”. 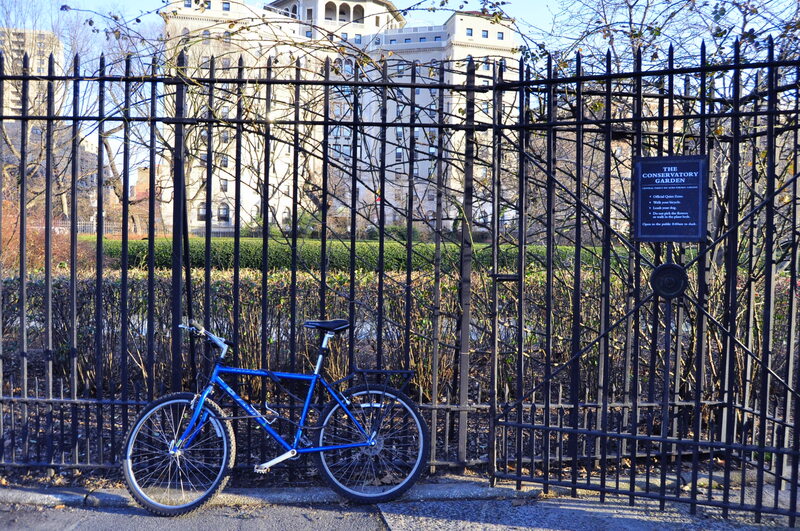 And, while the museum sits directly across from Central Park’s Jacqueline Kennedy Onassis Reservoir, Ms. Onassis agreed with Allen. 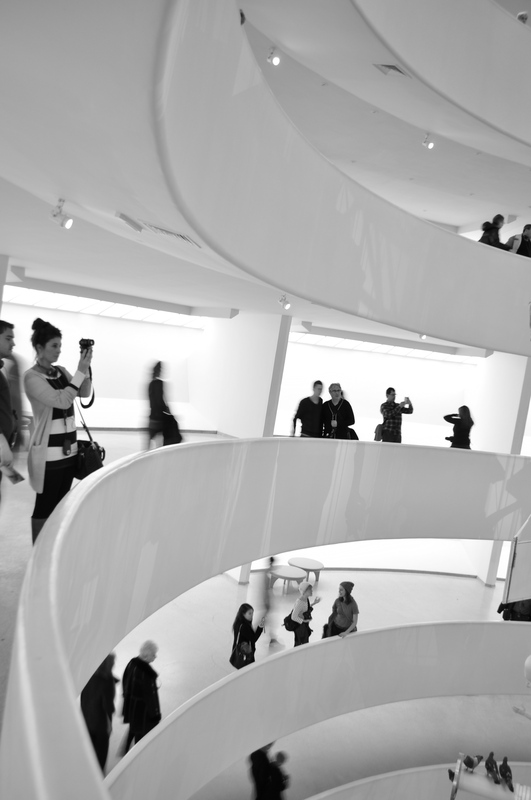 I have always loved The Guggenheim Museum. Located on the Upper East Side’s Fifth Avenue, to me it is emblematic of New York’s landscape; an architectural feat that I am in awe of. Whether admiring it from the outside or within, it’s a fascinating structure that stands the test of time and continues to inspire. Furthermore, museum’s renowned permanent collection always measures up to its temporary exhibits. 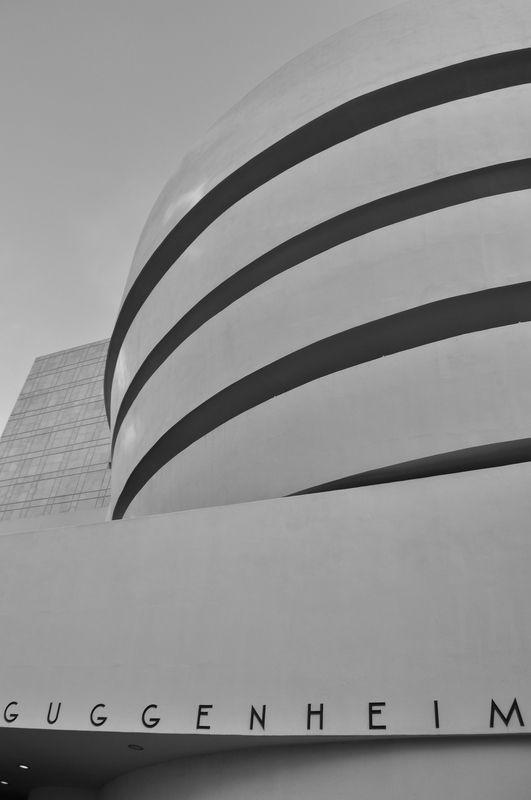 If you haven’t ever seen or visited The Guggenheim, picture a cylindrically shaped building that looks like a spring or a perfectly curled orange peel, but white. 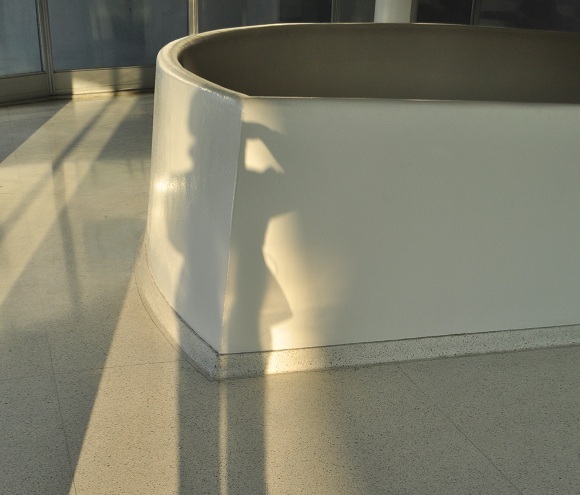 The art gallery circumnavigates the building’s walled interior and is viewed along a walkway that spirals its way to the top. (If you’ve seen the movie, The International, featuring Clive Owen and Naomi Watts, you may remember a lengthy action scene that took place in [a replica of] the museum’s interior). The walkway’s balconies look into the building’s (usually) vacant centre, crowned by a domed skylight. 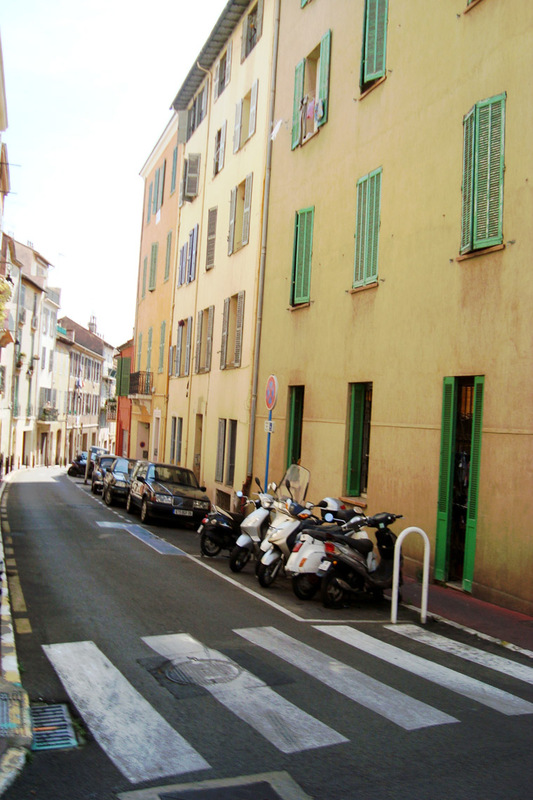 There are four levels of galleries that exhibit Impressionist, Post-Impressionist, and contemporary art works. 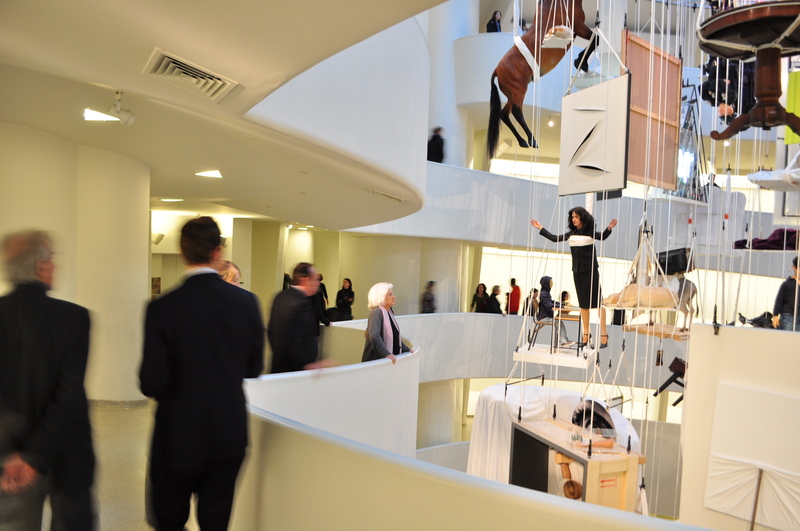 Recently, I visited The Guggenheim to see the popular — read: equally lauded and criticized — exhibit, Maurizio Cattelan: All. Said to be the final show of the artist-going-into-retirement, his retrospective hangs like a bejeweled chandelier of giant proportions in the heart of the museum’s rotunda, illuminated by the skylight immediately above. 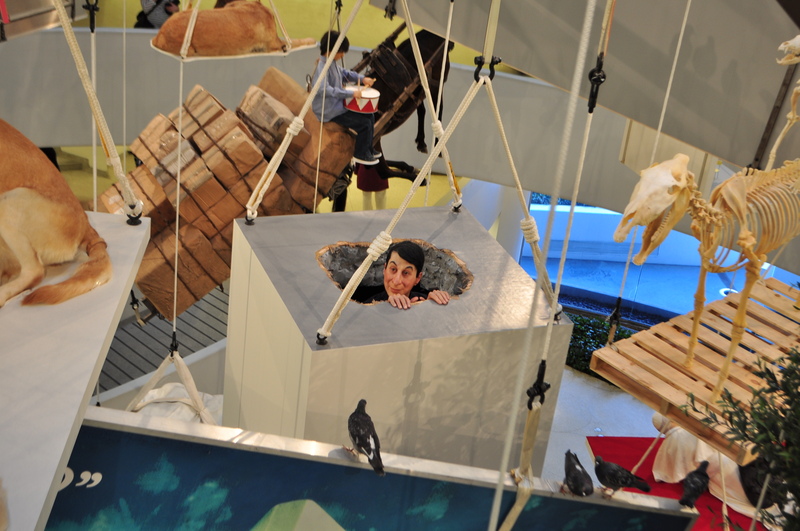 Unfamiliar with Maurizio Cattelan’s works, I was intrigued to view the exhibition. Cattelan has also been known to spread rumours about his artwork for self-promotion, and has been caught for creative theft. 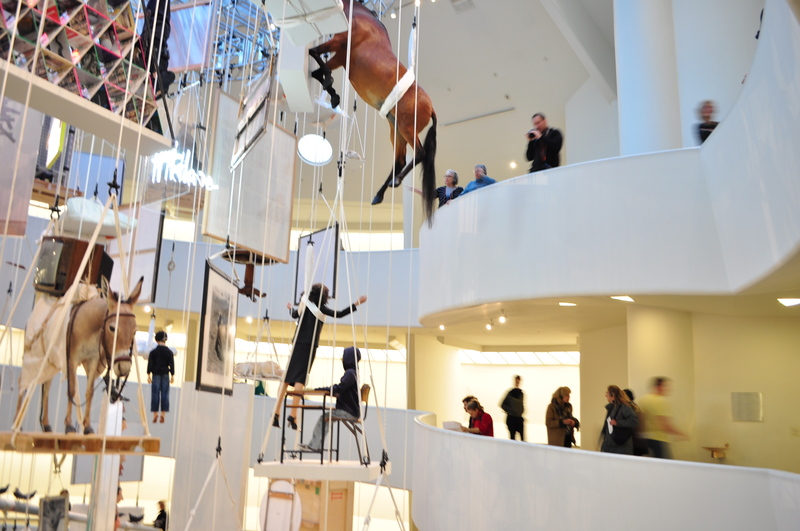 All shows the majority of Cattelan’s works (with a couple of exceptions as owners refused to pass them over) strung with ropes from a steel support structure. The exhibit feels morbid; one of its stronger underlying themes is death. 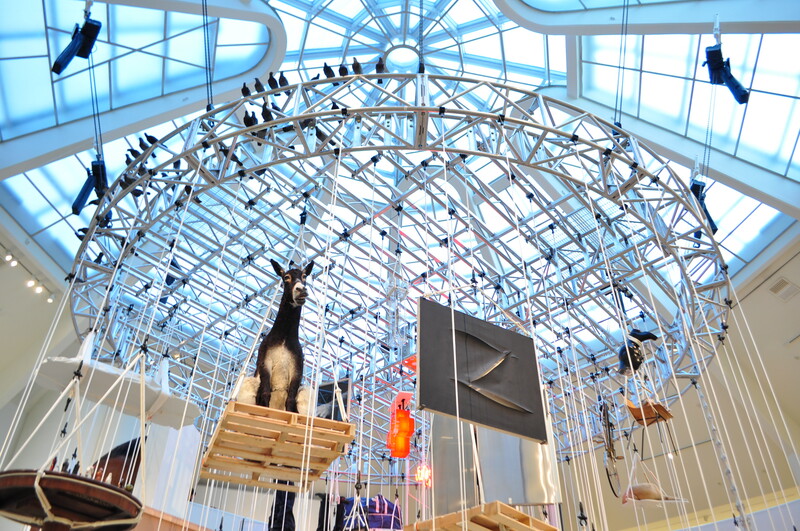 Perhaps the installation symbolizes a ‘mass execution’ of sorts. 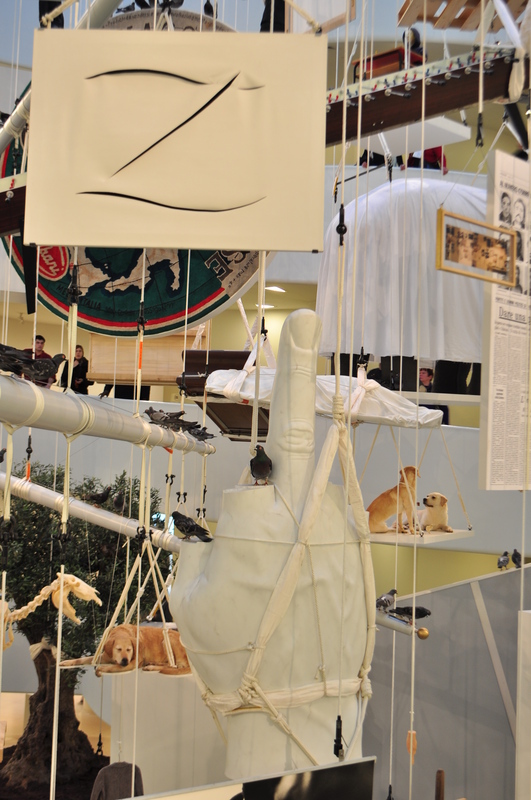 Cattelan’s body of work extends over a 21-year career; his style is satirical, political, and humorous. 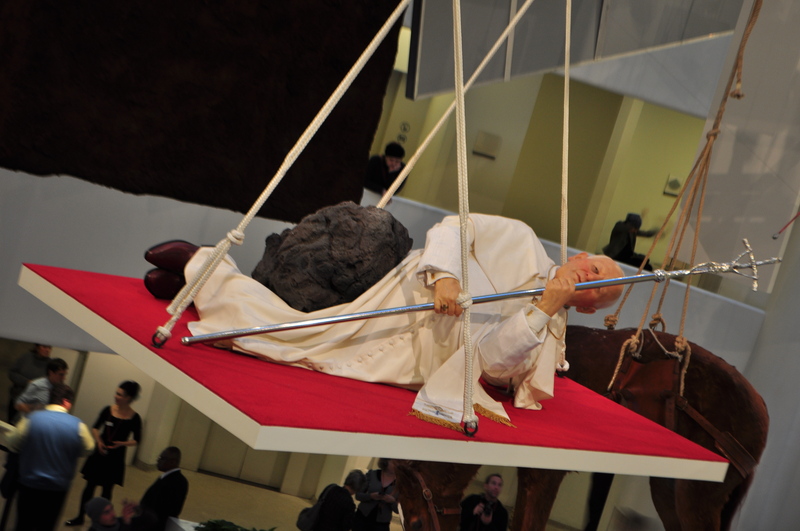 One of his earlier and more famous works includes La Nona Ora, a sculpture of Pope John Paul II felled by a meteorite. Translated to “The Ninth Hour” (1999), the work implies the hour when Christ died on the Cross. In 2000, this piece was shown in the Warsaw Zachęta National Gallery and “resulted in a public furor (that) ended in the resignation of Anda Rottenberg, the museum’s director, who refused to remove the work even after protests by members of parliament from a Catholic nationalist party, two of whom … attempted to succor the pope by picking him up from the ground.”. A more recent work, titled ‘L.O.V.E.,’ an acronym in Italian for love, hate, vendetta, eternity, was erected near Milan’s stock market this year (2011). Referred to as ‘the finger’, the 36-foot white sculpture of a hand, with middle finger giving the birdie, was in response to the financial crisis of 2008. Read more here: WSJ.com. 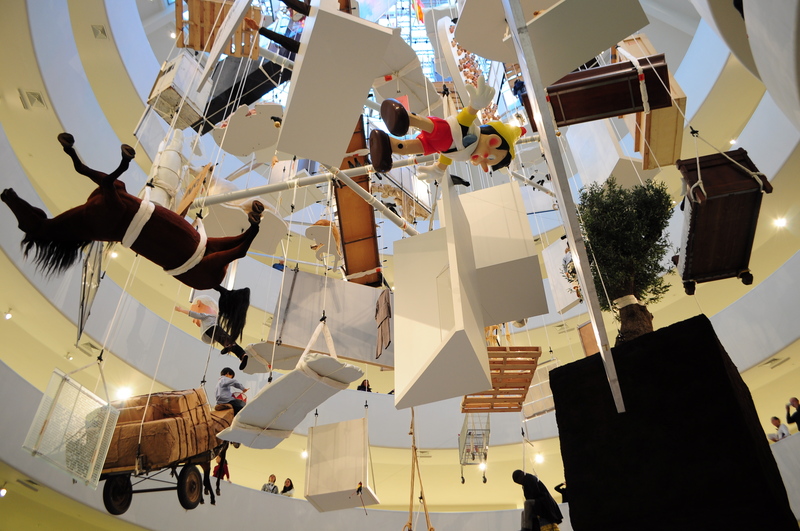 Cattelan’s installation deviates from the norm. 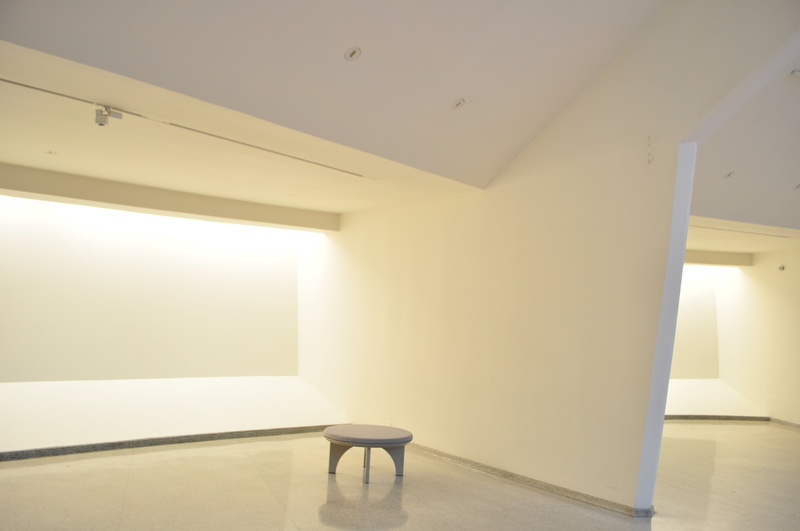 That is, usually the museum’s perimeter showcases artworks, but for now, it stands empty. It is stark in its whiteness, and looks futuristic. The focus is on the museum’s centre. 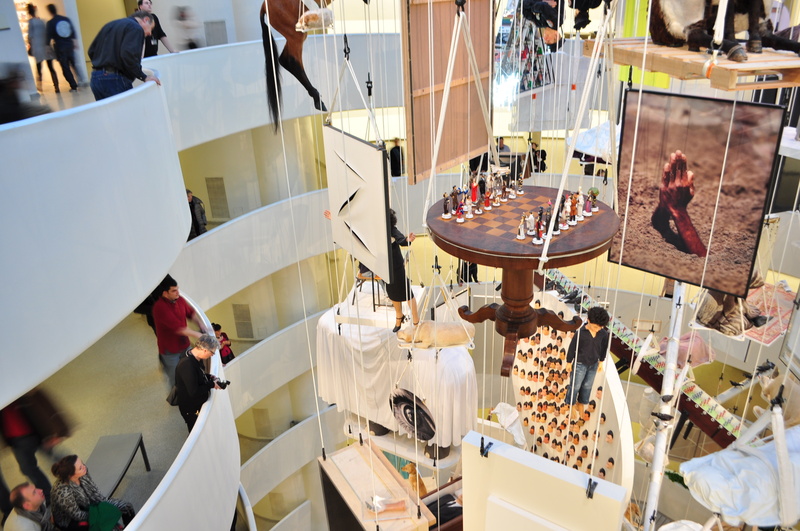 Erecting the installation at the core of the rotunda may have been Cattelan’s way of paying homage to the artists who petitioned against the building decades ago: in 1956, a group of artists, including Willem de Koonig, submitted a complaint to The Guggenheim’s trustees about the museum’s less-than-ideal gallery space. They complained that the walls were too concave for hanging art; the floor, uneven; the ceilings, too low. 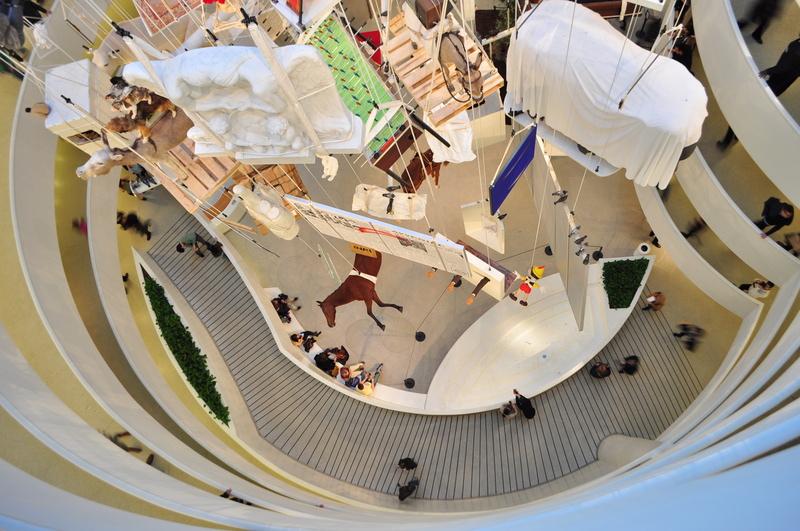 That said, by focusing on The Guggenheim’s centre, museum-goers can admire Cattelan’s installation from a distance instead of lining up to see art that could’ve been crammed into the gallery’s niches. The exhibition is alluring, yet quizzical and erratic in its presentation – there’s disorder, lack of context, and disarray. You question the point of the works, directly after they were created… and now. 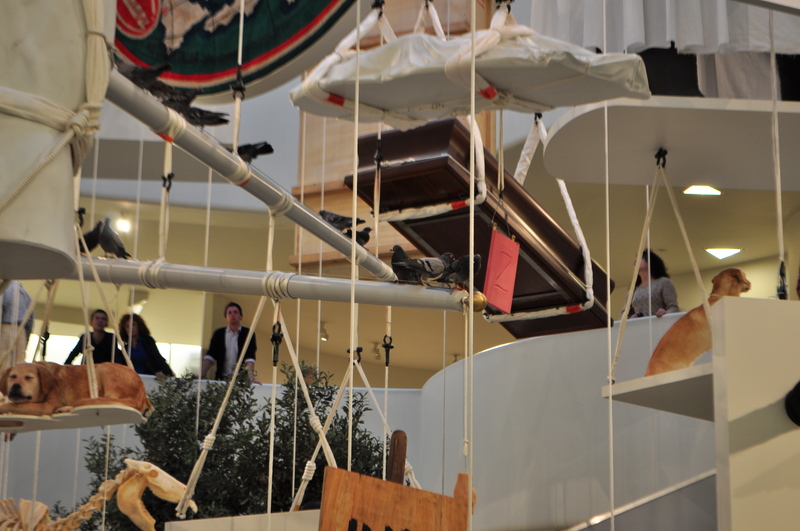 Is this installation really Cattelan’s final artwork? Is it in part a subtle social experiment, where museum goers are now on the outside, looking in, as if life is observing death? 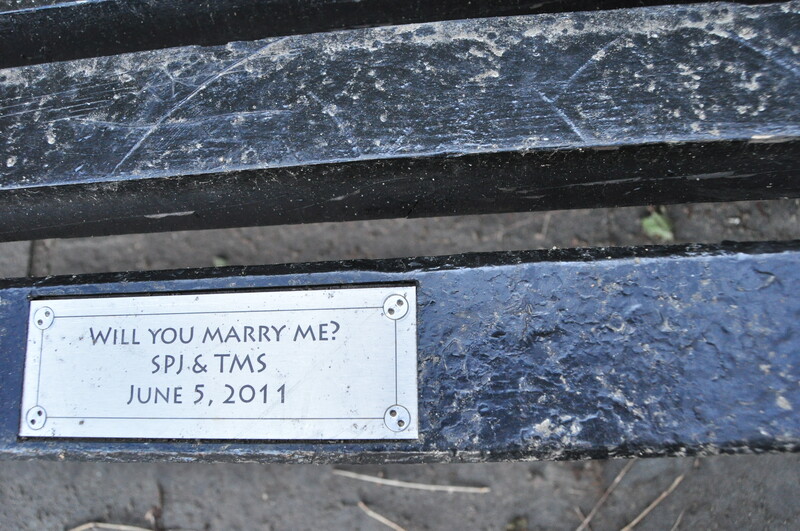 Social experiment? Life looking at death? I am not surprised that the exhibit has generated mixed reviews. You want to understand this giant body of work, but you can’t help wonder whether the whole is greater than the sum of its parts. 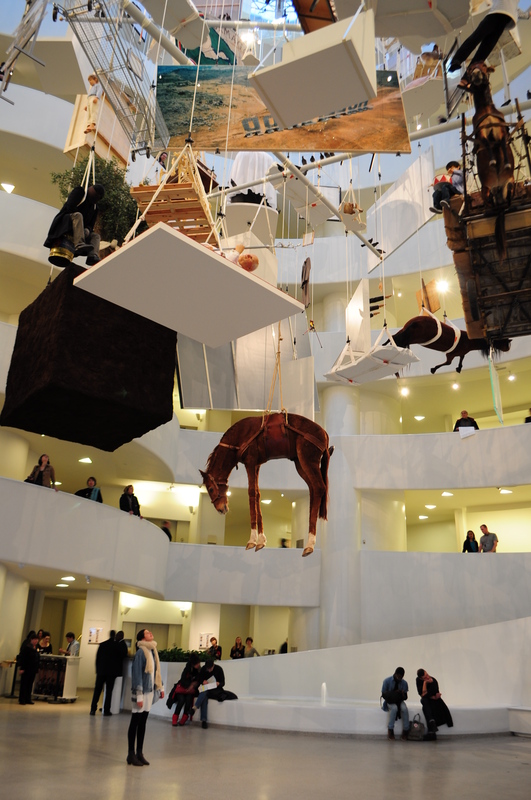 I came away from The Guggenheim with an appreciation of Cattelan’s perspective and was inspired to learn more about his individual works. Perhaps this was largely because the gallery was utilized in a new way. It was a stroke of genius to use the core of the rotunda to feature All; a new perspective allowed me to see with new eyes. Something has to be said for that. Gladiatorial combat existed in the days of the Roman Empire. If you’ve seen the movie Gladiator, you’ll know what I am talking about. A script didn’t inspire producer-writer-director Ridley Scott to make this movie — instead, it was a painting titled Pollice Verso* by French artist Jean-Léon Gérôme. 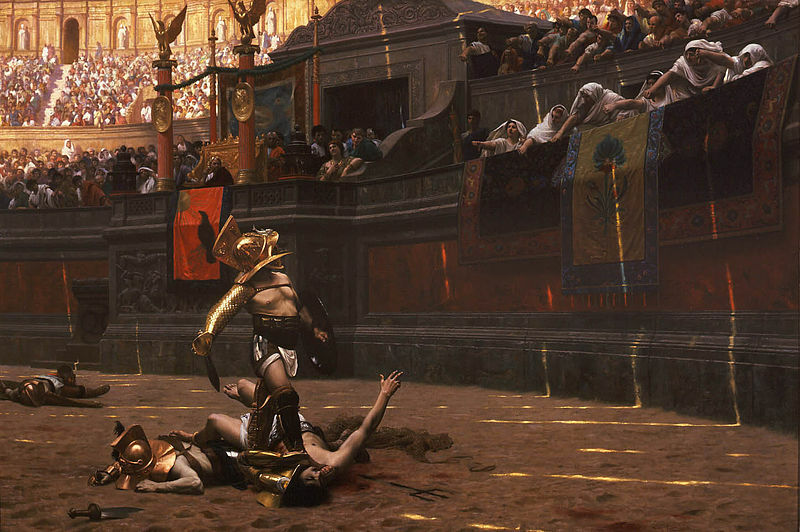 The painting shows the crowd decreeing death on a fallen gladiator. Scott said, “That image spoke to me of the Roman Empire in all its glory and wickedness. I knew right then and there I was hooked.” The venue for this form of battle? The Colosseum. 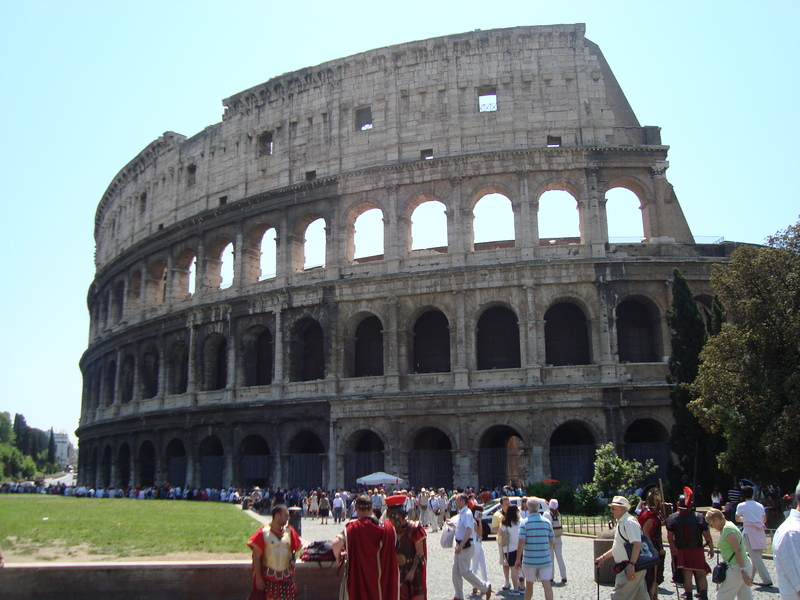 The Colosseum is one of the most visited monuments in Italy, and hosts up to six million people every year. The first thing that strikes you about it is its sheer size. In its heyday, the arena stood at 160 feet (49 meters) high, covered six acres (24,300 square metres), and could hold about 60,000 spectators with standing room for 10,000. Once one of the tallest Roman structures, the Colloseum’s imposing edifice has suffered from the forces of nature (earthquake, fire and lightning damage) and at the hands of man (who either stripped it of its decorations or used its stone in the construction of buildings such as the steps of St Peter’s Basilica). 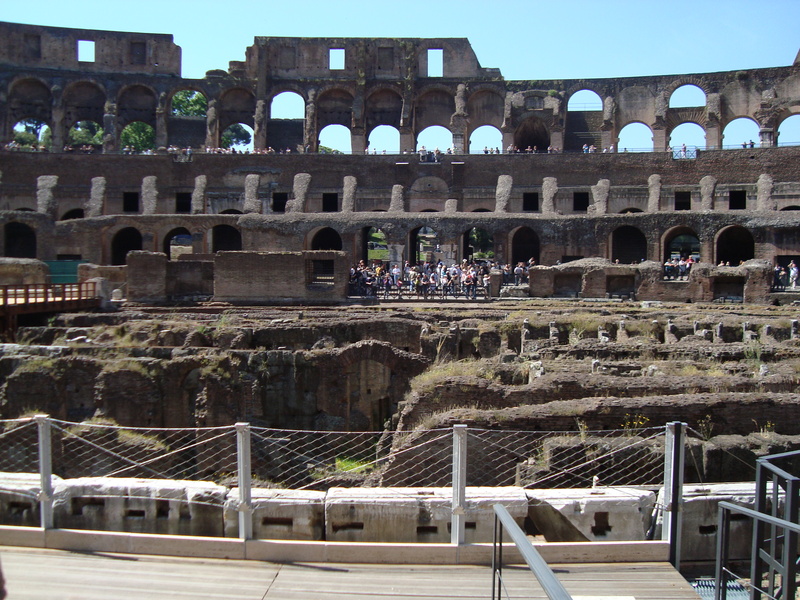 Completed in 80 AD after a 10 year construction process, the Colosseum’s elliptical arena rose to four tiers. Mostly used for seating, the first tier was reserved for senators and ambassadors, the second, for the wealthy, and the third, for the public. 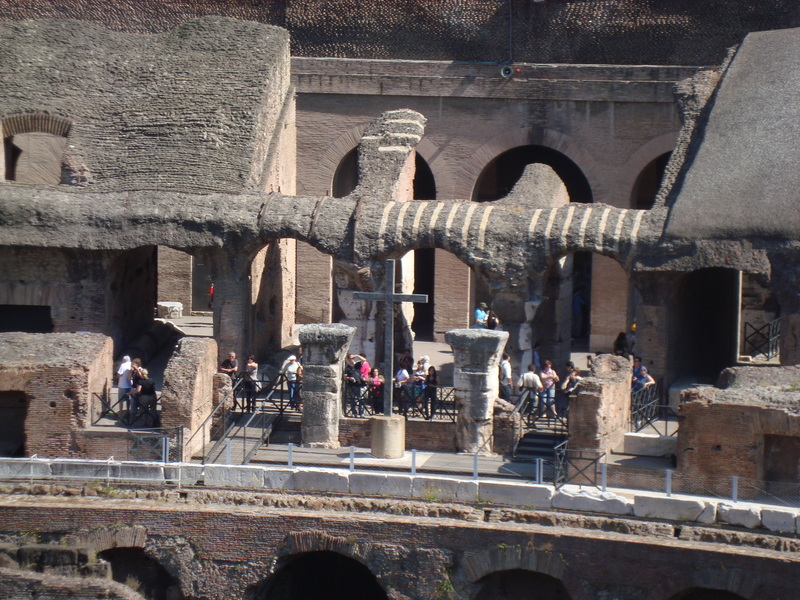 The fourth tier provided the support fixtures to anchor an awning over the Colosseum’s circumference to shield spectators from harsh weather conditions. Unlike the other tiers, the fourth tier had windows. The centre stage was covered in sand and was separated from the first tier by a high wall. When we visited in May 2011, the stage was being restored and below it you could make out the maze of tunnels and rooms that contained caged animals and gladiators before they were released onto the battlefield. Imagine the sounds of a roaring audience, the blaring of trumpets, and the beating of drums as the gladiators walked out of the passageways in the hopes of a victorious battle. To increase the element of shock and surprise, trap doors from the wooden floor of the stage were used to release ‘special guests’ during the ‘floor show’. The last known gladiator contest was held in 404AD. Legend has it that a monk, Saint Telemachus, protested the combats by attempting to stop a fight in a Roman amphitheatre. He is said to have been stoned to death by the crowd and his act of martyrdom effected the end of gladiator battles. 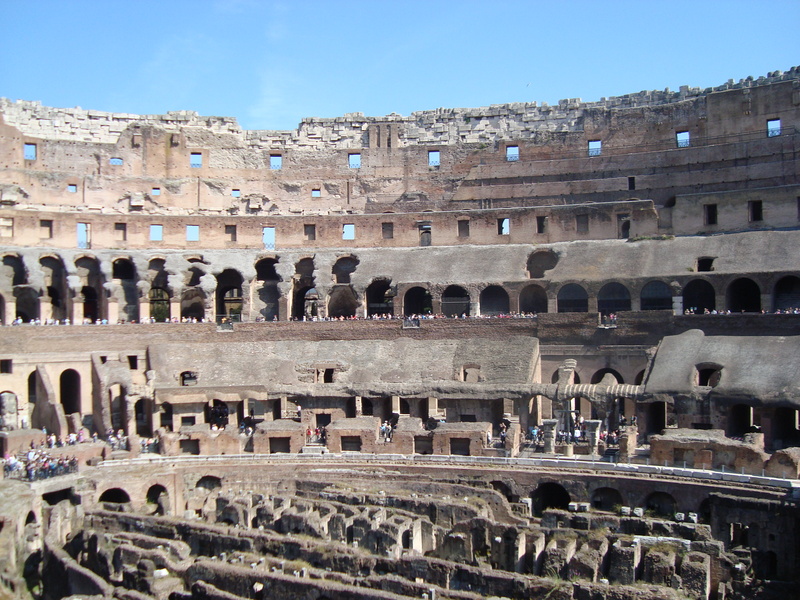 Considerable investment has been made to restore the Colosseum to its former glory. 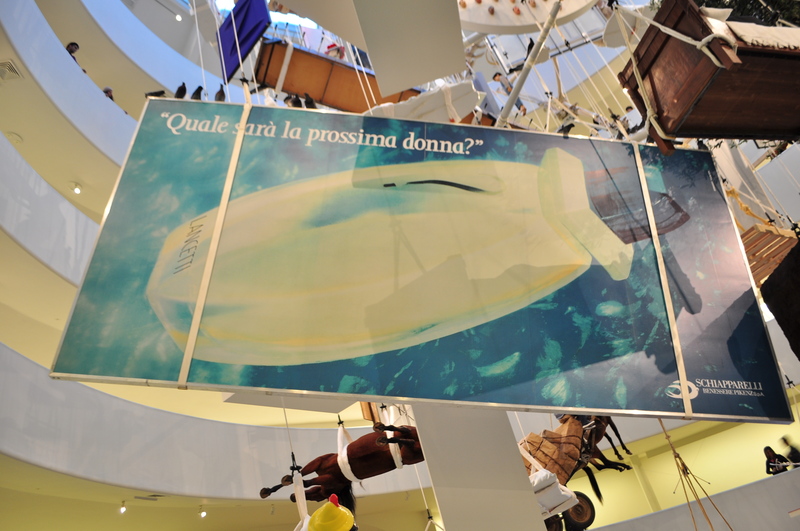 The founder of luxury leathergoods brand Tod’s, Diego Della Valle, pledged 25 million euros (US$34 million) to the project over a three year period. By 2014, visitors should have access to a quarter more of the ancient Roman remains. 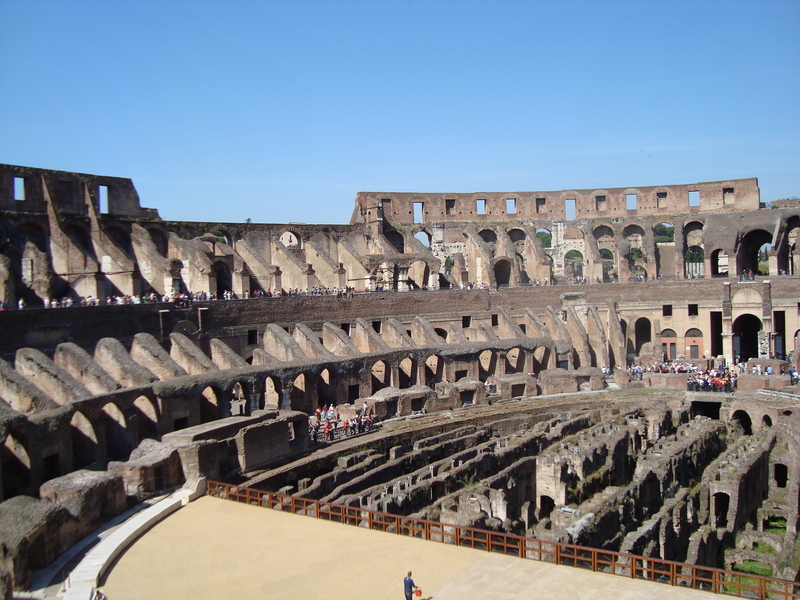 Click here to see a fantastic photo of the interior of the Colosseum. 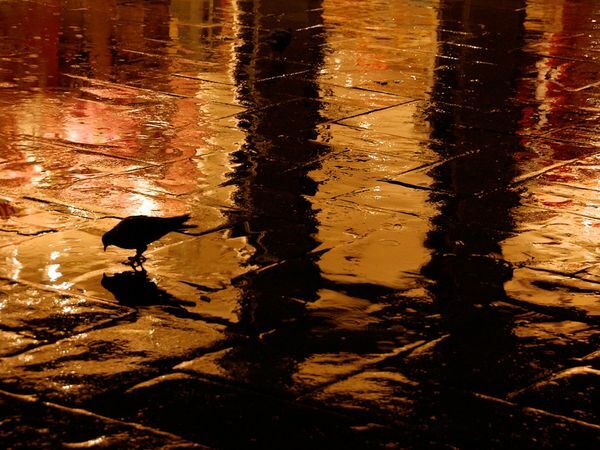 An amazing photo! 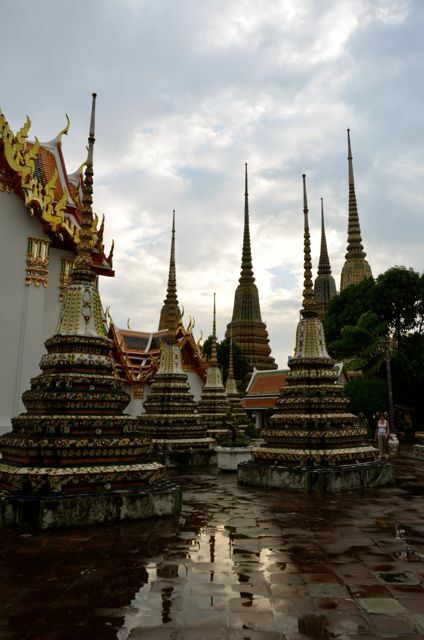 Tips: to avoid the long line for tickets, pay a couple more Euros and take the audio tour. This should guarantee you faster entry. Since the majority of the structure is viewed under the sun, don’t forget to bring sunscreen, a hat ….and sunglasses in the warmer months. *Translated as ‘Thumbs Down’ from the Latin phrase pollice verso meaning “with a turned thumb”. It can be seen at the Phoenix Art Museum, Arizona. See reproduction of the painting below.